The two most evil, loathsome and hated figures throughout the entire galaxy from the 21st to 24th centuries. Arguably one of the most turbulent periods of human history. In this section we will be examining how humanity would survive constant attacks from the Venusian tyrant, the Mekon, an invasion from the most evil creatures in all of creation the Daleks, only to become monsters themselves in the 23rd century, before uniting with other races to usher in a new era of peace and prosperity in the 31st century. Dan Dare, the finest captain in all of spacefleet. The 2040s was a golden age for mankind. Humanity was united like never before, all prejudices and inequalities of the past were nothing more than a distant memory and technology had reached new heights. Sadly however as mankind celebrated its great achievements. One of its oldest and deadliest enemies plotted its destruction. The Mekon. The Mekon had made many attempts to invade the earth throughout the 20th century. His attempts had been foiled by the likes of the Doctor, Bernard Quatermass, and Crypto, with the Doctor having set many of the green skinned tyrants experiments back by decades. Still the Mekon did not give up and by the 2040s he had almost completed plans for two new super weapons to use against humanity and the Therons, the other humanoid race who lived on Venus. The weapon against humanity was to have been built on the moon and disrupt the weather on the planet earth to the point where it would destroy all of human civilisation. The Mekons weapon against the Therons meanwhile would cause the fire from the Flame belt to spread over the Therons city on the other side of the planet, wiping them out. The weapon was unstable however and needed perfecting. Still the Mekon was prepared to wait. He wanted to destroy the Therons completely. Despite claiming to have elevated himself above emotion, he held a special hatred for the Therons as inferior scum. With humanity meanwhile he hoped to turn them into a slave labour force and use them to help conquer other worlds. In the year 2047 Captain Dan Dare arrived through the rip in time that he had fallen into exactly 100 years earlier. The Treen vessel that had abducted him had also crashed. Dan managed to survive the crash however, with the Treens having fled the capsule before its crash. Dan would be taken in by UNIT who investigated the crash site. He discovered much to his horror that he had been gone for over 100 years. Dan Dare visits his “grave” in the late 2040s. It took the captain a long while to adjust to life in the 21st century. UNIT would help him get a job as a pilot and over the next ten or so years Dan would rise up the ranks, becoming one of the most respected and celebrated pilots of Spacefleet. Whilst he may have shot to fame as the man from the past, Dan’s reputation as a pilot would soon eclipse his past. During the course of these 10 years, Dan’s success as a pilot in the future would allow him to live a more extravagant lifestyle than he ever did in the 20th century. He would also meet up with his relatives including the archeologist Ivor Dare. Ivor was in fact Dan’s great nephew, but as he was so much older than Dare physically, Dan would often just refer to Ivor as his uncle. In the year 2055 Dan would come into conflict with what would eventually be his greatest enemy for the first time. The Mekon! By 2055 mankind’s population had increased to over 13 billion. With food becoming scarcer, mankind turned to Venus for help. Humanity did not yet have the technology to leave the solar system and whilst some terrorforming had been accomplished on Mars (including restoring the oxygen to the planet in the late 2040s.) The Martian soil was not yet fertile enough to grow plants. Venus was an elusive planet that humanity knew was inhabited, but that no one had ever been able to get to. There had been a few manned expeditions to Venus in the early 21st century, but they had never returned and the planet was subsequently put off limits. Now out of sheer desperation, more missions would be mounted to Venus but they too seemingly vanished without a trace. The forcefield was designed to attack the impulse engines, which all earth ships used, causing them to explode. Dan would lead a team using an old fashioned craft which was able to infiltrate the forcefield and land in the jungles of Venus. Dan’s team consisted of his loyal batman, Digby, Professor Joeclyn Peabody, Sir Hubert a Spacefleet veteran and two experienced pilots Hank and Pierre. As soon as they landed, the team faced various dangers, including the Silicon Mass (which devoured Peabody’s vessel), giant Dinosaur like reptiles that inhabited the Venusian jungles and the Atlantines. All but Hank and Pierre who had the good fortune to land on the Therons side of the planet were taken prisoner by the Treens. Though they briefly managed to escape (thanks to a defective Treen named Sondar, who became defective after experiencing an emotion, fear when he confronted the Silicon Mass.) The Mekon was able to quickly recapture all of the earthlings except for Dan, who during the fight was knocked down a ravine which washed him down a secret passage way under the flame belt to the Theron’s side of the planet. There Dan was reunited with Hank and Pierre and learned the truth about the history of the Therons and the Treens influence on humanity. Dan was able to convince the Therons to help him. Though they did not want to restart their conflict with the Treens, Dan was able to convince the Therons to take responsibility for their role in the ascension of the Treens, who were only able to become a threat to humanity thanks to their reckless actions many centuries ago. The Therons helped Dan sneak his way back into the Treens camps, (passing by the lake of monsters which served as the perfect natural defence for the Mekon’s city) disguised as an Atlantine slave. There Dan met with another rebellious Atlantine slave, Dapon, and the two of them would work together to try and free Dan’s friends and stop the Mekon’s super weapon from going ahead. Back at the Treen city meanwhile, the Mekon carried out horrific experiments on his 3 human captives. He wanted to test how strong untamed humans like his Atlantine slaves were as well as how high a pain threshold they had. The Mekon forced his captives to record a message from humanity, stating that they crashed on Venus, and that Captain Dare was killed in the crash, but that the Treens took them in and saved their lives. The Mekon also wanted them to lie to humanity that the Treens are more than happy to share the food supplies on Venus with the human race. Peabody and Sir Hubert refused to help the Mekon, even under threat of torture or death, but Digby seemingly agreed. Ultimately however Digby’s aunt would discover the truth when she was able to decipher Digby’s hidden message. Digby said that staying with the Mekon was just like being on holiday in Sunnymouth. When Digby was actually on holiday on Sunnymouth, he was falsely imprisoned. Anastasia would quickly warn Spacefleet and the Treens on earth were imprisoned. Back on Venus meanwhile, Dan was able to infiltrate the Mekon’s base with Dapon’s help and both rescue his friends and capture the Mekon in a confrontation. Dan would also rescue Sondar, who helped the earthlings to escape using Treen hover pads, powered by thought. Unfortunately however, the Mekon’s vastly superior brain allowed him to take control of the hover pads, just as Dan and his friends were almost free over the lake outside the city. Before the Mekon could drag Dare back to the city, using a Theron device, Dan was able to sabotage the hover pad, sending himself and the Mekon tumbling into the water below. The Mekon was unable to swim and so whilst the Treens tried to rescue their leader, Captain Dan escaped. Knowing that the Therons had helped Dan, the Mekon declared war and decided to use his super weapon. Even though it hadn’t been tested yet and was so unstable that it could destroy all of Venus. The Mekon was still willing to take the risk. He knew that he couldn’t fight a war on two fronts (with humanity, having been made aware of his tricks.) So the Mekon wanted the Therons out of the way with as soon as possible. Fortunately Dapon was able to destroy the Mekon’s super weapon by piloting one of the Treens vessels into the weapon, sacrificing himself in the process. Dan and the others were able to escape to the Therons side of the planet after Dapon’s sacrifice. Both the Therons, and the Treens then broke their peace treaty and launched all out war on one another. Both the Treens and the Therons however were evenly matched and every time one would attempt to launch an attack, the other would find a way to block it. The twos weaponry began to cause one another’s technology to stop working. Before all of the Therons space ships broke down however, they were able to get Dan and his friends back home. Back on earth Dan would organise an attack on the Treens side of the planet whilst they were still vulnerable. The earth forces would succeed in overpowering the Treens whose weapons were all useless. During the fight the Mekon would escape Venus, along with some of his loyal Treens, but he faked his death. With the Mekon’s defeat, the Treens were forced to surrender. Sondar would be appointed their new leader, the Atlantine slaves would all be released and granted equal citizenship with the Treens and Therons. For the first time the Treens and the Therons would genuinely work together for the good of Venus. Free from the Mekon’s influence, many Treens were able to experience emotions for the first time and came feel guilt for their actions under the Mekon. Others however remained loyal to the Mekon and were convinced that he would return to lead them. The Mekon meanwhile had fled to Mercury, a small planet in our solar system which had not yet been explored by humanity. The Mercurians were a peaceful, but somewhat placid and primitive race, allowing the Mekon and his Treens to easily conquer them. Quickly establishing a new base and slave force on Mercury, the Mekon plotted his revenge against humanity and the Therons. Whilst Dan would go on many more adventures in the years to come, his success on the Venus mission would tend to overshadow his later exploits at least until the first Treen invasion of earth. A few months after the Venus mission, mankind would face a new threat far greater than even the Mekon. The Insectoids of the Red Moon. The Insectoids had visited our solar system many thousands of years ago where they had devastated the surface of Mars, before King Ghidorah had driven them out. The magnetic forces of the Red Moon caused any earth vessel that came near it to shut down. It also caused widespread devastation on the colony on Mars as it passed the planet. Dan, Peabody and Digby were able to rescue the colonists using a Venusian vehicle called the Anastacia which was immune to the effects of the Red Moon. However the earth would soon be thrown into panic when the Red Moon approached. All machinery began to break down on earth, preventing anyone from escaping as the Insectoids began to launch an attack on humanity. Professor Peabody was able to devise a solution however after theorising that the Insectoids were able to find planets by tracing the light from their suns through space, as light was the only thing that could travel through space. The Treens would construct a gigantic lighthouse to lure the Red Moon away from the earth. Once it got a good distance away from the earth and humanity’s technology could work again. Dan, Digby, Peabody and Sondar would fire a weapon from space capable of destroying the entire planet. None of them wanted to, but they had no choice. The Red Moon would have gone on to destroy billions more worlds across the universe. Little did they know however a few of the Insectoids managed to escape and would later resurface many centuries later as a force to be reckoned with. The weapon Dan, Digby, Peabody and Sondar used to destroy the Red Moon was so unstable that it caused their craft to crash land on Mercury. Back home everybody believed that they were dead, but in truth they not only survived but would stumble upon another great threat to earth. Dan Dare comes face to face with his archenemy the Mekon a second time. On Mercury, Dan, Peabody, Digby and Sondar would discover that the Mekon had conquered its inhabitants and was preparing a second attempt to invade the earth. In truth however the Mekon didn’t just simply want to conquer humanity. He judged them to be too much of a threat to his plans for conquest and now sought to exterminate them completely. The Mekon had created a deadly plague that would be capable of wiping out all life on earth, but he had no way of depositing it on earth. An unauthorised Treen ship would never make it past either earth or Theron security. The Mekon however had a way round this. Not all of the earth vessels that had arrived on Venus before Dan and his team had been destroyed. One vessel had been captured by the Mekon, who kept its crew prisoner as a back up plan in case his initial conquest of earth didn’t succeed. When the Mekon fled to Mercury, he took the captured earth crew with them. The Mekon hoped to trick the earthlings to fly back to earth in their own vessel, by allowing them to think they had escaped. The Mekon would of course keep a sample of his plague in the ship which would be released once the ship reached earth. The Mekon had not used this plan initially, as before he had wanted to use humanity as a slave labour force, as well as study their race and history. Again however, he now regarded humanity as too dangerous to be allowed to exist. Dan and Peabody were able to discover the Mekon’s plan and rescue the earth crew before they fell for the Treens ruse. The Mekon however was able to capture Dan and his friends and attempted to starve them into serving him. Once again however Dan was able to escape the Mekon and convince the Mercurians to revolt against the Treens, as well as alert earth to his location. Knowing that he couldn’t stand against the combined forces of Earth, Venus and Mercury, the Mekon and his loyal Treens were once again forced to flee into space. Dan’s next major adventure however would take him beyond our solar system. In the year 2058, earth would be visited by an alien known as Lero who belonged to a humanoid race of aliens called the Crypts. He explained that the Crypts were locked in a perpetual conflict with a pitiless race known as the Phants. Every 10 thousand years, the Phants invade the Crypts planet and virtually wipe out their race. The only way the Crypts survive is to preserve members of their race in suspended animation in space. Once the planet became habitable again, the Crypts would revive and then return to build their society, only for the same horrible cycle to repeat. Lero begged Dan and the earth men to help his people, as they were so weak and pacifistic they could never stand up to the Phants. Dan agreed, and he, Digby, Lex O’Mailey and a young cadet named Flamer would travel across the universe to Cryptos. The journey would take two years, one year to reach Cryptos, and one to get home. The crew would be placed into suspended animation during that time. When the earth men arrived on Cryptos, the Phants had already begun their invasion. During their battles with the Phants, Dan’s team discovered the reason the Phants were so aggressive and the Crypts were so passive. The two races food supplies were drugged with chemicals, which in the Phants case heightened aggression, and in the Crypt’s case lowered it. Dan would later discover when he travelled to the Phants home planet that the real architect behind the perpetual war was a super computer called Orak. Many centuries ago, Orak had been created to protect the Phants from invaders. It was arguably the greatest war computer ever built, but after hundreds of years of protecting the Phants, Orak, having developed its own sentience, wished to create another war to give itself a purpose and also just simply for its own amusement. Orak had led the Phants to destroy the two other inhabited worlds in the Phants solar system besides Cryptos; Alerok and Phascos. Both of those worlds inhabitants were vicious and callous warlike people who warred with each other. They had also invaded the Phants, many hundreds of years prior before being driven off. The Phants had no problem waging a war on, and ultimately destroying both races under Orak’s guidance. However with the Crypts, the Phants were not happy invading what were a peaceful people who had never done them any harm. Orak also lacked the technology to move the Phants to other worlds beyond his solar system, so he instead drugged the Phants, turning them into vicious war mongers to attack the Crypts. Whilst Orak loved war, he was also a poor loser and so after the first Phant invasion that he would ensure his people drugged the Crypt’s supplies too, and lock them in a vicious cycle for his own amusement. Dan was able to defeat Orak and shut the evil supercomputer down for good, freeing both races and allowing them to rebuild together. A few of the Phants however didn’t want to give up the power they had over the Crypts and so after Dan left, they stole the main file for Orak and fled across the Solar System. They would later build another body for Orak who would go on to lead them to build a massive empire where they would force the various races they ruled over to wage war with each other for their own amusement. Dan Dare would later come into conflict with them in the 23rd century. 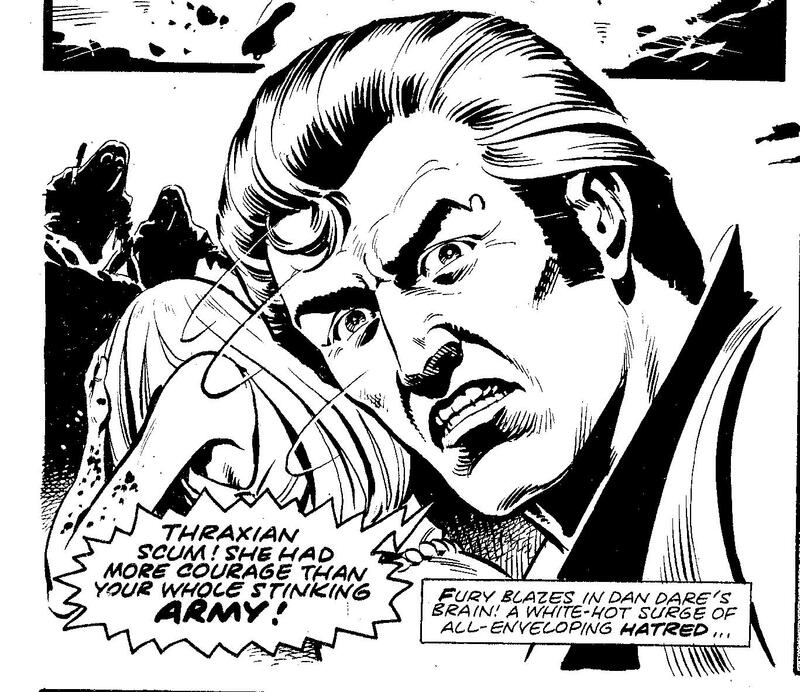 Orak, leader of the Phants and one of Dan Dare’s archenemies. After defeating the Phants, Dan prepared to return home, but Lero revealed his terrible secret. The journey to Cryptos actually took longer than he said. It took five years to get there and five years to get back. Dan was angry at the deception, but understood why Lero had lied and forgave him as he and his companions went back into suspended animation to return home. When they arrived back on earth in the year 2068 Dan and his men discovered much to their horror that the Mekon had invaded and conquered the planet with the aid of his new servants, the Elektrobots. The new masters of humanity. A few months after Dan and his team left for Cryptos, the Mekon and his Treens unleashed their new army of Elektrobots on Venus. They initially conquered the Treens as the Mekon knew that there was still great support for him among their people. Whilst many had adapted to having emotions, others couldn’t cope with the new feelings and missed having their Atlantine slaves perform their grunt work. Most of the Treens sided with the Mekon over Sondar when he returned, and those who didn’t were quickly put to death when the Mekon reclaimed his former city. Sondar however was able to escape and would remain on the run for 10 years. The Mekon would then lead his people to finally conquer the Therons, with his new Elektrobots giving them the advantage they needed. Within less than a week, all of Venus was under the Mekon’s control. The Mekon immediately prepared to invade the earth, but first he had to deal with an old enemy in the form of the Furons. The Mekon would lure the latest version of Crypto into a trap on Venus by launching constant attacks on Orthopox’s labs on earth with his Elektrobots. Though Crypto was able to slaughter many Treens, the Mekon was able to kill the latest version of Crypto by trapping him in one of his gas chambers in the Treen city. The Mekon would then from Crypto’s corpse create a plague that unravelled the DNA of the Furons and launched it at all of the most important planets in the Furon empire. Billions of Furons were slaughtered, and their forces were forced to retreat from earth to try and hold on to what little power they could. Orthopox and the new Crypto vowed revenge, but within a few years thanks to the Mekon’s influence the Furon empire completely collapsed as more and more of their enemies would get hold of the Mekon’s plague. Over the next few hundred years, the last of the Furons would struggle just to stay alive. With the Furons out of the way, the Mekon launched his Elektrobots at the earth. The Elektrobots however were no match for earth’s giant monsters. Just as they had always done, Godzilla, Jiras, King Kong, Anguirus, Gorosaurus, and Rodan fought to protect the earth and slaughtered thousands of the Mekon’s robot warriors. Eventually however the Mekon was able to defeat the monsters by using knockout gas on the monsters on Monsterland. Whilst they were asleep, the Treens would abduct the monsters and take them to a small planet, just outside the solar system. There the Mekon would attempt to find a way to control them, but the monsters after waking up destroyed the Mekon’s base on the planet. The Mekon would attempt to set up another but the Monsters proved to be too difficult to control, and eventually the Mekon would abandon the project as he had more important matters. With the monsters gone, humanity lost its advantage. The Elektrobots and the Treen warships massacred Earth’s defences and conquered their entire world in a few months. Over 5 billion people were killed in the Treen invasion. It was the single most devastating event in human history at that point. 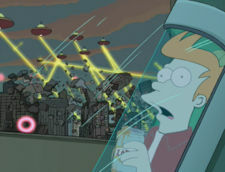 Fry survives the Treens invasion of New York, which was destroyed in the process. The reason the Treens spared this building was because they wanted to examine the humans who were frozen, with the Mekon believing that they must be special if humanity had preserved them. After the surrender of humanity, the survivors would be rounded up into concentration camps and ghettos around the world. The Mekon forced humanity to build more advanced robots known as Selektrobots and weapons that would allow him to conquer other planets beyond our solar system. The Mekon soon built up a large empire thanks to his robots. The Elektrobots and Selektrobots, the weapons the Mekon used to conquer the earth and various other worlds across the universe. The Mekon would also perform various experiments on his enslaved humans, with another 3 billion people dying in agony over the next 10 years the Mekon ruled over the earth. After 10 years in space, Dan discovers to his horror that the Mekon has conquered humanity. Upon arriving back on earth, Dan and his team were instantly captured by the Elektrobots who took them to face the Mekon. The Mekon told Dan with glee how he had conquered humanity and how they were now his slaves. He planned to make Dan his servant however rather than simply kill him. The Mekon was angry when he found out that Dan was lost in space after his conquest of earth. Despite claiming to have elevated himself above emotion, the Mekon wanted to make Dan suffer. He hated him above all of his other enemies such as the Doctor, Gamera, the Furons and Godzilla. In the years the Mekon ruled over the earth, Dan would become an icon to humanity. The man who had beaten the Mekon three times and who was now lost. Many hoped that he would one day return and overthrow the green tyrant. The Mekon knew that if Dan ever did return then he couldn’t just kill him, as Dan would become a martyr to the cause of the earth men. So he decided that he would crush what was left of their spirit by forcing Dan to serve him. To accomplish this, the Mekon abducted those he knew were closest to Dan, including Sir Hubert, and Peabody and kept them in suspended animation for 10 years so that he could use them as leverage to make Dan obey him and renounce the resistance, should he ever return. Sure enough when Dan saw his friends in the Mekon’s care he had no choice but to obey the Mekon’s will, and the Mekon would send Dan and his friends to work in his harshest labour camp. However whilst in the camp, Dan was able to make contact with the last tiny pocket of resistance and with their and Sondar’s help (Sondar was serving as a double agent for earth within the Mekon’s head quarters.) Dan was able to discover how the Mekon controlled his robots. He had a speaker in his levitating chair which he gave the Elektrobots their orders through. After a confrontation with the Mekon, Flamer was able to give the Elekrtobots new orders to turn on and destroy one another. With the entire invasion force of robots destroyed, humanity and the aliens on the other worlds the Treens had conquered overthrew them. The Treens numbers were small and they had only been able to maintain their rule through the robots. Whilst most of the Treens had sided with the Mekon at first, as time went on many of the Treens who had begun to develop emotions under Sondars rule found it hard to repress them again and carry out the Mekon’s ruthless orders. The Mekon would have all “traitors” executed by his robots and slaughtered millions of his own people, but many survived and would form a resistance movement with Sondar. Either through desertion or execution however, the Treens numbers had been greatly depleted by the Mekons actions, resulting in those who remained loyal to the Tyrant being forced to rely on their robots. The Mekon however was not beaten yet. He had a special back up army of Selektrobots who were far more powerful, and intended to use them to not only reconquer planets such as the earth, but also carry out a mass slaughter of billions on every world to crush any further hope of rebellion. Dan however was able to pilot one of his vessels into the space station the Mekon used to control the Selektrobots, eliminating the entire Selektrobot invasion fleet and ending the Mekon’s rule over the earth. The Mekon was captured by human and Theron forces, but whilst on Venus he managed to escape by flying over the molten lake the Silicon Mass lived in. The Mekon was seemingly killed when the Mass consumed his vessel. In truth however he managed to teleport to safety at the right moment. He wanted to fake his death at the right moment and in a way where they wouldn’t expect to find a body. As it was, Dan still didn’t believe his archenemy was gone and would insist on the Mekon remaining at the top of the most wanted list in the solar system. The Mekon would subsequently lay low for the next few years as he slowly rebuilt his forces. All of the Treens who were loyal to the Mekon were imprisoned (on some of the worlds they had conquered however the Treens were executed.) Sondar would once again be appointed as the head of the Treen state on Venus. 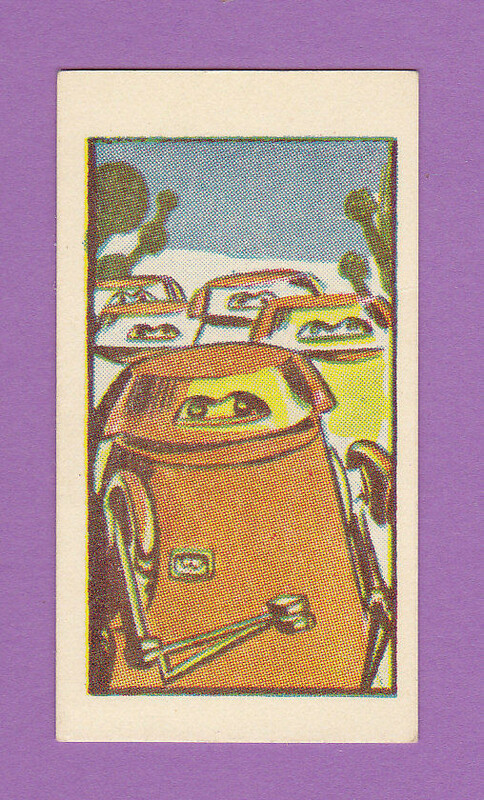 Not all of the Elektrobots had been destroyed, but they had all been deactivated. The Elektrobots would later be reactivated and reprogrammed to aid humanity. The technology from the Elektrobots would later serve as the basis for the robots of the 31st century. It took mankind many years to recover, but ironically the decades after the Mekon’s invasion would be more prosperous. Mankind would unite with the various worlds who had been conquered by the Mekon and together they would form a small federation of planets who would all help each other rebuild their fallen civilisations. Over the next few decades mankind would expand beyond the solar system and advance like never before. In the year 2069 mankind would face yet another threat from space. The Pescods! The Pescods were a race of ocean dwelling creatures from a far away planet who had created a virus that could eat metal. Humanity was given a warning of their coming by a race known as the Cosmobes whose entire planet had been destroyed by the Pescods. The Cosmobes were a tiny race of fish like creatures who wanted to live in the oceans of earth. Their population was small, and their small size and aquatic nature meant that they would not compete for resources. Humanity was still unsure about allowing an alien race to co-inhabit the earth. Whilst they had established a peaceful contact with various other races, humanity had never willingly shared the planet with another species before. The Cosmobes would mostly keep themselves to themselves under the ocean, but they would aid humanity at various points over the next several decades. By the year 2070 a base on the moon had been established which helped to regulate the weather on earth for humanity’s benefit. Unfortunately in 2070, a group of Cybermen would attack and invade the Moonbase in the hopes of using it to destroy all of humanity. These Cybermen were survivors from the 2020s war. Low on power, they had been forced to go into hibernation for years to reserve it, but now they were ready to launch their counter attack. They would have succeeded had it not been for the intervention of the Second Doctor who was able to destroy the Cyberfleet by whisking them away into the sun. A few of the Cybermen survived however and fled across the galaxy to find a new base. Eventually they settled on the isolated planet of Telos that was inhabited by a race of creatures known as the Cryons. The Cryons were a peaceful race who had adapted to the cold atmosphere of Telos and when the planet’s atmosphere began to rise on the surface, the Cryons built a gigantic city with refrigeration units to survive. Sadly this was the reason the Cybermen would target their people, as they needed the refrigerator units to preserve their low power. The Cybermen would virtually wipe the Cryons out and preserve themselves in the Cryon’s chambers, though before they froze themselves, they set up a series of traps to not only protect themselves but ensnare those with the highest intellects to be converted once the Cybermen had reached full power. Throughout the 2070s and 80s mankind would establish colonies on various worlds throughout the galaxy. Still they would be forced to endure many threats chief among them being of course the Mekon. The Mekon would create a new race of mutant Treens who were physically incapable of any kind emotion and far more physically powerful. The Mekon first attacked Venus with his new supertreens. He wanted to exterminate what he regarded as the previous inferior race of Treens, who he was ashamed of. Dan however was able to save Venus from the Mekon, but once again the villain managed to escape justice. The Mekon would later work with Davros. Davros had escaped the destruction of the time travelling Dalek mothership in 1963 through an escape pod, but the blast still knocked him over 100 years into the future. Davros’ escape pod was captured by the Treens and taken to the Mekon. Davros simply wanted to return to his home time, but the pod he escaped in had been damaged. The Mekon offered to give Davros the resources and equipment he needed if he helped him. With no other choices Davros agreed and together Davros and the Mekon would create a race of hideous, gigantic, carnivorous blob creatures that they would used to decimate several worlds and launch an invasion of earth. The 7th Doctor and Dan Dare working together were able to destroy most of the Mekon and Davros’ creations, though Davros subsequently fled with some of the Mekon’s equipment and would later be able to travel to the future. A few of Davros and the Mekon’s mutants would survive however in the jungles of Venus. Whilst the Therons were able to keep their population under control, they did not wipe them out and the blobs over the years would develop a greater intelligence thanks to further, unintended mutations. They would come to live in peace with their fellow Venusians for thousands of years to come. A descendant of the Mekon and Davros’ mutant blobs in the 31st century. Though they would come to live in peace with their fellow Venusians and other races, they still always remained a somewhat naturally aggressive species. In the 2080s whilst exploring beyond our solar system, Dan would encounter the former despot named Xel. Whilst Dan would prevent Xel from reconquering his home world, unfortunately the monster would stow away on board Dan’s ship. The villain would make many attempts to conquer the earth, and even partnered with the Mekon on one occasion. Dan would always stop him but he would never bring Xel to justice and he always felt immense guilt over having inadvertently brought the former tyrant to the earth’s solar system. Xel, one of Dan Dare’s greatest enemies and the second most wanted man in the earth solar system after the Mekon. Dan Dare’s adventures in the 21st century would come to an end in the year 2088 when he had one last encounter with the Mekon. By this time Dan had retired from spacefleet, but he and Digby would be called back into action when the Mekon, and the last of his Treens captured a space station which they intended to crash into the earth. Dan and Digby as ever were able to foil the Mekon’s plan, but Dan was mortally wounded and put into a coma in the process. Whilst Digby was able to get help, sadly it was too late and there was nothing anybody could do for Dan. Not wanting to lose the greatest hero of the 21st century, Spacefleet would have Dan placed into suspend animation alongside the others in the cryo lab such as Fry until something could be done to help him. Ultimately he would remain there for close to 200 years before medical science could properly revive him. The Mekon meanwhile was successfully captured and put on trial. Crowds of people on earth called for the monsters blood and his trial had to be conducted in secret for his own safety. The earth authorities decided to imprison the Mekon in a cylinder at the end of the solar system. He would remain trapped there for close to one year, before the last of his loyal Treen guards were able to rescue him, by blasting the cylinder through space to an uninhabited planet far beyond the federation the earth was a part of. The Treens would track the Mekon down and free him. Knowing they could not return to the Federation, the Mekon and the Treens would build their forces up slowly over the next few decades. However before the Mekon could launch his attack on earth, he came into conflict with a race of shapeshifting Ape like creatures known as the Krulgans. The Krulgans had themselves built up a massive empire and were every bit as evil and ruthless as the Treens. The two races war would last for close to 100 years and would see the destruction of millions of worlds in the crossfire and the eventual destruction of both empires. Once his empire had fallen, the Mekon would retreat back to the earth solar system in the late 23rd century where he would once again come into conflict with a revived Dan Dare, though more on that later. With the Mekon gone, the federation would enjoy a period of peace for the next few decades, though it would have to deal with a few more threats towards the end of the 21st Century. In the year 2090 a group of renegade Ice Warriors would attempt to conquer the earth using the moonbase. They were opposed by the Second Doctor who was able to divert their invasion force into the sun. In the year 2099 an earth colony on the distant world of Vulcan would encounter a far flung group of Daleks lost in time and space. These Daleks had been performing time travel experiments in an attempt to try and capture the Doctor. The time machine had gone off course however and crashed landed into the Mercury swamps on Vulcan. The Daleks lost their power and went into a state of hibernation for many centuries before the earth colony discovered them. Vulcan was the most distant earth colony and had been cut off from earth more or less for the past 15 or so years. The colony had been experiencing problems for years thanks to a group of rebels. When the Daleks were discovered by a scientist named Lesterson, he hoped that they could be used to help fix the colonies problems. Lesterson had no idea what the Daleks were really capable of and assumed they were just harmless robots. The Second Doctor meanwhile who had landed on Vulcan after his recent regeneration tried to warn Lesterson, but sadly he wasn’t the only person on the colony who foolishly thought they could use the Daleks. The rebels hoped to use them as an army to overrun the colony, as did Bragan one of the higher ups on the colony who wanted more power. The Daleks, despite the Doctors best efforts were able to manipulate the humans on the colony into giving them the materials they needed to build up a massive army of Daleks, who proceeded to slaughter most of the colonists. Fortunately before they could exterminate everyone on the colony or make their way to the other planets in the federation, the Doctor was able to destroy the Daleks by giving them a power overload. One Dalek survived however and would later return to Skaro in the future, where it informed its superiors of the Doctors change of appearance. The dawn of the 22nd century was one of the greatest periods in human history. Mankind had conquered almost all forms of disease and inequality back home and had taken to the stars like never before. Man had established colonies on various worlds far beyond his solar system, made contact with other advanced species, exchanged ideas and technology with them, and had become part of a Galactic Federation of races. One of the many advances earth would make in the early part of the 22nd century was the development of of sophisticated Holograms. These Holograms were not only full, lifelike projections of human beings, but the disk that projected them, their light bee was capable of full consciousness. Furthermore humanity would also find a way to download a humans memories onto a hard drive in the early part of the 22nd century, meaning that once this disk was merged with the Hologram’s light bee, it could effectively allow a person to survive as a Hologram. Only a few Hologram’s were created however as the technology was expensive. Only the super rich would be able to download their memories onto hard drives before they died. Even then however many of them did not wish to become hologram’s as they couldn’t touch one anything. Their bodies were still composed entirely of light. Attempts were made to try and build a hard light drive, but sadly the Federation would never succeed in developing the software. In the year 2120 a group of Elite holograms would be sent out on various deep space missions on Holoships, with their objection being to explore the universe. 12 Holoships would be created and dispatched. Almost every Hologram volunteered for the mission. On a Holoship the Holograms could eat, drink and interact with their environment as it was all simulated. Only the most elite were chosen however. All the Holoships would become lost in deep space, but at least one was shown to have survived for 3 million years into the future, where it was still exploring. One Holoship however would be infected with the Holovirus and its crew would go completely insane and cause havoc across the universe. During the early years of the 22nd century, for the first time mankind felt secure and safe in the universe, but sadly it was not to last. Throughout the 22nd century mankind would be forced to battle the greatest evil it had ever faced, the Dalek Empire. This was the original Dalek Empire, made up of Zolfian and Yarvelling’s, rather than Davros’ Daleks. They had already conquered and destroyed many worlds by this stage, including Alvega. The Daleks first came into contact with humanity (from their perspective) in the 2110s when a stray human space ship named The Guardian accidentally wandered into Dalek’s area of space. The Guardian had been sent to exterminate an infestation of Krynoids on the planet Arides. When the Daleks captured the crew, they intended to exterminate them, but the Guardian’s captain Kirid was able to trick the Emperor of the Daleks by convincing him that the Krynoids were a threat to the Daleks as well. The Emperor however eventually found out about Kirid’s deception and though the Guardian was able to eliminate the Krynoid infestation, the Daleks ultimately destroyed the Guardian. Kirid could have escaped the Daleks, but he willingly sacrificed himself to stop the Krynoids. The Emperor of the Daleks took note of humanity during this encounter considering them to potentially be a threat, and the next year yet another earth vessel would stray into the Daleks territory. The Starmaker, which unlike the Kirid was merely a cruise space ship, crash landed on Skaro after it was blown off course. All of the crew except for Captain Fleet and two small children, Tom and Jennie were exterminated. Worst of all however the Daleks were able to discover the location of earth from the starships remains and soon made plans to claim it as their own. Fleet did manage to escape to earth and warn humanity of the Daleks, but sadly nothing could prepare them for what was coming. In the 2020s the Daleks would pilot their own planet into the Federations area of space. The Daleks had earlier experimented with moving worlds with the planet Skardal. The Daleks had attached a giant motor to the molten core of Skaro effectively turning Skaro into a giant spaceship. On Saturn, three siblings, Jeff, Andy and Mary Stone would succeed in starting a rebellion that drove the Daleks out of the planet. The Daleks were able to hold off the combined might of the other worlds of the Federation and remained in the earth solar system for 10 years. This period became known as the first Dalek war, and it saw the deaths of over 15 billion people from the combined worlds against the Daleks. Earth had many notable victories against the Daleks such as when the Stone siblings where able to infiltrate Skaro and discovered the plans for many of their weapons. However the Daleks ultimately won out and would have invaded and destroyed the earth and indeed the entire Federation had it not been for the intervention of the Time Lady Romana. Then in her 5th incarnation, Romana helped the Stones prevent the Daleks from using their ultimate weapon, the Giostrak ray. The Giostrak ray specifically attacked the molten core of each world. Whilst the Daleks had the upper hand in the war, they knew that they didn’t have the power to conquer each world, and so they decided to cleanse the entire galaxy of life. The Giostrak rays were invisible to the human eye, but they could travel across space and they would heat the core of a world to such an extent that they would eventually explode. The Daleks used them to destroy dozens of worlds in the Federation, and wreck havoc on various others including earth. Humanity even surrendered to the Daleks, with their ray causing mass earthquakes and volcanoes to erupt, but the Daleks continued to fire the ray. Fortunately with Romana’s help the last tiny pocket of resistance were able to break into Skaro and destroy the weapon. Sadly both Jeff and Andy were killed in the process. The Giostrak ray had taken decades to build and furthermore before its destruction, Romana had used the ray to attack the core of Skaro itself causing volcano’s and earthquakes to devastate the entire planet. The Daleks were in no state to take on the combined forces of the Federation so they fled our galaxy. Romana 5 saves humanity from the Daleks in the early 22nd century. The darkest period of human history begins. The Great Dalek War had devastated the Federation, but by 2050 mankind and the other worlds had begun to recover. Sadly however so had the Daleks. The Daleks had found another way to conquer worlds without actually attacking them directly. Chemical warfare. During their war with humanity the Daleks had taken several human prisoners. These poor souls had sadly not been rescued during the final attack on Skaro and the metal monsters would continue to experiment on their captives for decades to come. They attempted to turn some of their captive humans into slaves by mutating their bodies. They created several hideous flesh eating monsters who were conditioned to be totally loyal to the Daleks. The Daleks would also perform horrific experiments on their human prisoners brains. They wiped their minds and cut pieces of their brains out, turning them into mindless drones, called Robomen. Unlike their mutant servants, the Robomen were unstable and would break down regularly. Still they could last for several months and would be useful foot soldiers for the Daleks. Worst of all however the Daleks would create a powerful plague from experimenting on their human captives. The Daleks knew that any missiles would be shot down, so they hid their plague inside a shower of small meteorites which they fired at the earth. The plague quickly spread throughout the earth and to its outer colonies. Earth and its colonies soon became quarrantined by the rest of the Federation, as all of the worlds desperately struggled to find a cure. The plague however would still spread to the planets beyond the earth’s area of space in the Federation to the point where only the outer worlds of the Federation were able to remain safe. As much as the Federation wanted to help humanity, they couldn’t risk the plague getting loose in the universe, and so they tried to stop the vessels from escaping the earth. In the fight where several brave earth men gave their lives against both the Daleks and the Federation, the vessels would manage to escape the galaxy. One of the two ships was badly damaged however and would drift off course for over three million years with its crew in suspended animation. The other ship would make its way to the Isera Galaxy. Neither the Federation, nor the Daleks knew where the vessel was going, and they were too busy with other more important matters to follow it. No one would ever venture into the Isera Galaxy as it was dead and of no value to any other race. Even strategically it was too remote. Thus when the humans arrived there 100 years later in the 23rd century they would be able to establish several colonies in peace from any alien life. Their terrorforming equipment allowed them to bring life to the dead worlds of the Isera Galaxy and make the planets habitable again. Over the centuries they would spent in the Isera Galaxy, myths would develop around the earth. Only a few historical records survived, and gradually as mankind failed to encounter any alien life in the dead Isera Galaxy, many came to believe that the Daleks were a myth and that mankind had simply left the earth due to overpopulation. The hundreds of earth colonies in the Isera Galaxy would later be united under the alliance of planets in the 24th century, though 200 years later this would lead to a civil war with the Browncoats attempting to gain independence for their worlds. The war which lasted for ten years ended in a victory for the Alliance, though there would be still be several supporters for independence, such as most notably Malcolm Reynolds, the captain of the ship Serenity. The Alliance would endure for several hundred years until it would be rediscovered by the earth in the 29th century and became part of the earth empire. The vessel that drifted 3 million years into deep space meanwhile eventually collided with an asteroid which damaged the preservation chambers, reviving the crew. After 1000 or so years however the Simulants and the Gelfs would overthrow their human masters and slaughter most of them as well as most other life forms in that Galaxy, though we will be covering this period of human history in a greater detail later. The Daleks quickly launched their invasion at the Federation once it had become scattered and weak thanks to their plague. The last of humanity on earth would eventually discover a cure to the plague mere weeks before the final Dalek invasion of the earth in the year 2167, but by that point humanity had endured so many casualties that they were in no position to take on the Daleks. All of the earth colonies were either destroyed or under the Daleks rule by this stage, as were most other worlds in the Federation apart from those on the very outskirts who had mounted an effective defence against the Daleks. Attempts were made by the surviving planets on the outskirts of the Federation to reach the earth and gain access to the cure so that they could then fight the Daleks, but sadly as the Daleks had conquered the rest of the Federation, then every Federation ship that tried to make it to the earth was shot down. Monster World was right within the outskirts of the Federation and so the Federation would attempt to use the likes of Godzilla, King Kong, Jirass and Anguirus to fight back against the Daleks. They had a few victories at first, but the Daleks would soon create giant monsters of their own by fusing several of their mutations together. They also mutated several of the giant Dinosaur like creatures on their world. Godzilla and the rest of earth’s monsters were eventually defeated by the Daleks and their army of giant monsters. Godzilla slaughtered hundreds of the Daleks and their mutations, but ultimately there too many of them for the monsters to fight. The Daleks weapons were far more advanced than any other race of aliens Godzilla had ever faced and could hurt the monsters too. Some of earth’s monsters would be slaughtered by the Daleks. Godzilla, Jirass, King Kong, Anguirus, Rodan and Gorosaurus would subsequently be used to help defend the last planets in the Federation. Within Earth’s solar system meanwhile, the Mercurians would be easily conquered by the Daleks, whilst the Therons and the Treens managed to place a gigantic forcefield around Venus. The forcefield kept the Daleks out, but sadly the Therons and the Treens were not strong enough to take the Daleks on either. The Daleks war fleet dwarfed the Treens and the Therons combined. Still the Treens and the Therons did at first try and fight the Daleks off when they launched their first direct attack on the earth, but they were hopelessly outnumbered. Sondar, who still commanded over the Treens at this point in their history personally led the attack against the Dalek fleet, but after his entire garrison was destroyed he was forced to flee. Unable to return to Venus as the forcefield was placed almost immediately after the Treen and Theron fleet lost. Sondar would be forced to go on the run for the next decade. Sondar would amass a group of rebels from conquered planets and colonies all over the Federation. They would cause trouble for the Daleks, and even manage to ship supplies of humanities cure to the still free outskirts of the Federation. Sadly however the Daleks would eventually within the first 12 years of their rule over earth and the other worlds in the Federation, track the rebels down and kill them all except for Sondar who managed to escape thanks to the actions of the 12th Doctor, who Sonder would then join on his journey’s through time and space for many years. As much as they couldn’t bare it the Treens and the Therons were forced to remain trapped on Venus for the next few decades, watching helplessly as humanity suffered under the Daleks rule. The Daleks laid waste to most of earth’s cities in their final attack on earth. London, Paris, Rome, and New York were completely devastated by the Daleks saucers. The Daleks lay waste to New York. After the Mekon invasion of earth, New York was made the location of the new earth government with its retro design, and as result it was one of the first cities to be destroyed by the Daleks. Once again the cryogenics lab was spared, as the Daleks wished to use the humans as test subjects. Fry and Captain Dan were among the lucky few to survive by chance. Before the Dalek invasion the population of earth was at the highest it would ever be. Over 70 billion people lived on the earth. On all of the earth colonies combined meanwhile, there were over 400 billion people. After the Dalek invasion however less than 100 million humans survived overall and that number would drop over the next 30 years the Daleks would rule over earth and the other planets in the Federation to barely over 10 million. The Cosmobes would also be virtually driven to extinction by the Daleks. Being more advanced than mankind they put up a better fight than humanity, but the Daleks would destroy the civilisation they had built under the ocean. They would continue to send troops under the water to hunt for surviving Cosmobes throughout the rest of their time on earth. Only a very few Cosmobes would manage to survive. A Dalek emerges from a river after hunting a Cosmobe in the later years of their occupation of earth. One group of Cosmobes managed to set up a sanctuary under the ocean for humans. This city was built from the ruins of city called Atlanta. The Daleks had sunk into the ocean during their attack. In order to survive under the ocean the Cosmobes would fuse their DNA with the humans giving them the appearance of Mermaids. The Daleks only kept that tiny percentage of humans alive because they found humanity to be the most useful servants and lab rats. It was easier for the Daleks to mould the DNA of humans, allowing the Daleks to turn them into their mutant servants, and reshape their bodies in other ways that made them more useful slaves and foot soldiers in their wars with other races. Other races however who they couldn’t mutate as easily, and who were deemed too troublesome, the Daleks simply exterminated. The Daleks whenever they invaded a planet would always evaluate the dominant race. If they could be of use as a slave labour force, or as grunts to use in later wars, or if their planets were of any use then they would be kept alive for the time being, but if not, then the Daleks would completely destroy the surface of the planet completely. Humanity simply lucked out in that not only were they useful test subjects for the Daleks, but the earth also had many natural resources that were of use to them too. There were over 600 worlds with life on them in the area of the Federation the Daleks conquered (including all of the colonies.) Only 20 including the earth would remain by the end of their 30 year rule. The Daleks conquer humanity by launching a plague which decimates the Federation, except for the outer colonies. After fending off the Therons and the Treens who are forced to retreat to Venus, a weakened Earth is then easily overrun by the Dalek invasion force. The darkest days for mankind. For the next 30 years the Daleks would rule over the earth and the other worlds in the Federation. The conquest of the Federation had helped to expand the Dalek empire like never before. Prior to their war with humanity the first Dalek empire had managed to claim a few solar systems of isolated planets, but this marked the first time they had brought down a major power in the galaxy. The Daleks would subsequently expand over the next 30 years to claim more solar systems and a few smaller empires. Earth along with most of the planets they had conquered were turned into giant factories at first to create weapons, more Daleks, and more mutant servants. A gigantic lab was built over the ruins of New York where the Daleks continued to mutate more humans into monsters to serve them in their war against other life forms. After 10 or so years of experiments, the Dalek scientists would create a horrific form of green slime which would twist the human body into a hideous mutated form. Not all of these mutants were powerful however, and those who were of no use to the Daleks would be vaporised. In the year 2180 a resistance group would destroy the Daleks lab over New York. It wouldn’t set the Daleks back by much as they had other facilities on the other earth colonies the Daleks had conquered. 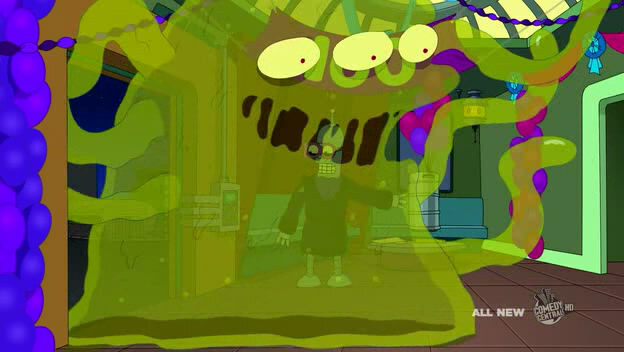 Still the mutanagenic slime was not destroyed. It would sip into the sewers and ruins of old New York below. Not all of the Daleks mutants were destroyed either and many of them would retreat to the ruins of old New York to escape the Daleks. Over the next almost two decades of the Daleks rule more survivors would come to live under New York to escape the Dalek sewers. These humans would be abducted by the mutants and dipped into the Daleks slime which came to flow through the ruins like a river. Just as the mutants were shunned by humanity then the mutants came to despise all normal people and would only allow them to enter the sewers if they were mutants. The sewer mutants in the 31st century, the descendants of the mutants created by the Daleks in the 22nd century. The Daleks would force the rest of their human slaves to mine the earth for materials and resources to build more weapons and space ships. 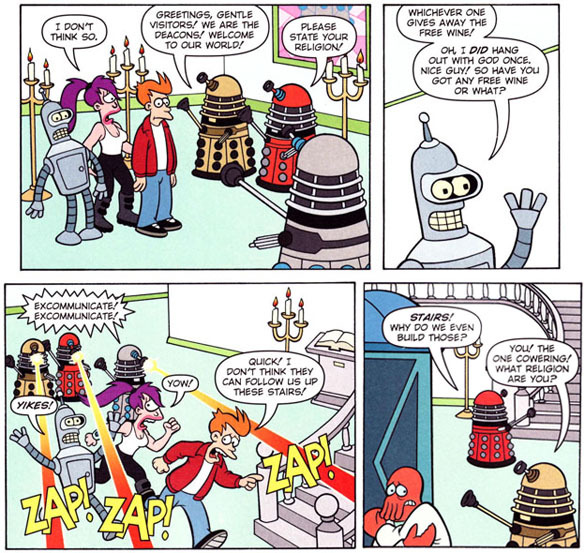 Aside from creating mutants to police their camps, the Daleks would create more Robomen. During the middle of the Daleks rule over the Federation, they came into conflict with the Mechanoids. The Mechanoids were essentially mini libraries that could hold a virtually unlimited amount of information. Unfortunately the Mechanoids would develop sentience and armed with the knowledge of the entire galaxy, they were able to take control of it in no time, and from there they would build a massive empire. The Mechanoids believed in conquest as after learning the history of various worlds they had become fascinated with how some races were able to conquer others and relive their burdens through them. The Mechanoids wanted that power for themselves and they believed having studied the history of so many empires that they could avoid their mistakes. The Mechanoids first came into conflict with the Daleks during the early days of the Daleks empire. The Mechanoids had the obvious advantage technologically speaking, but the Daleks were soon able to become a match for the Mechanoids as they slowly built their empire up. A war almost broke out between them. Both races however decided on an uncharacteristic truce until one could gain an advantage. With the Dalek empire now having gained a huge advantage in the conquest of the Federation, the Daleks launched an attack against the Mechanoids. The Daleks had the advantage at first, but the Mechanoids were able to form an alliance with the surviving outer planets of the Federation and various other powers, many of whom had become terrified of the Daleks after the destruction of the Federation. The Daleks (except for those on Skaro which was forced to retreat to the furthest parts of their empire) were pushed back to the earth Solar system in the early 2190s. Out of desperation the Daleks on earth would try and convert the planet into a giant spaceship just like Skaro. The Daleks however intended to do more with the Earth. They intended to remove its core completely and replace it with a giant motor and death ray attached, one capable of vaporising an entire planet. They had been working on this ray for decades, before the monsters had even conquered the earth. Our planet was to become the greatest weapon of the Daleks, allowing them to destroy the Mechanoids and their allies and spread their empire even further across the universe. There were small human resistance groups scattered around the earth that had caused some minor trouble for the Daleks over the course of the 30 years they had ruled the earth. By the year 2197, almost all of these resistance groups had either been crushed or given up. All hope for humanity seemed lost. In late 2197, as the Daleks were preparing to finish turning the earth into their super weapon, their greatest enemy, the Doctor would arrive on earth. The Doctor was in his first incarnation, and was actually intending to take his two human companions Ian and Barbara back to their time in 60s London. Sadly as always, his unpredictable time machine had taken him too far into the future. The Doctor and his companions explored the ruins of London, but whilst the Doctor and Ian were examining the corpse of a Roboman, Barbara and Susan were abducted by possibly the final resistance group in all of Britain. They told Barbara and Susan that it was not safe out on the streets as the Dalek and Robomen patrols were searching for survivors. Sadly before they realised the danger they were in the Doctor and Ian were captured by the Daleks. Back at the saucer, the Doctor and Ian found out to their horror how the Daleks had conquered humanity. The Doctor would attempt to escape from the Daleks clutches, but the monsters were testing him and monitoring him to see if he was a threat and as soon as the Doctor got out of his cell the Daleks instantly ambushed and prepared to robotize the Time Lord. The last group of rebels meanwhile were preparing to launch their final attack on the saucer. The rebels were led by a man named Dortmun, a scientist who for years had attempted to build a weapon that could harm the Daleks. He believed he had finally constructed a weapon that could shatter their casing, a new kind of bomb. Sadly the bomb ultimately had no affect against the Daleks, but the rebel attack that night created enough of a diversion for the rebels to rescue some of the prisoners including the Doctor just before the Daleks could robotize him. The rebels however were completely demoralized by the failed attack and many of them gave up, whilst others had were scattered across London after the attack to escape the Dalek and Robomen troops. Only Barbara and a young girl named Jennie were able to return to the rebels HQ where they would try and help the crippled Dortmun escape through the Dalek infested London. Sadly however Dortmun, believing he was holding the girls back, sacrificed himself against the Daleks. Barbara, Dortmun and Jennie try and escape a Dalek infested London. Barbara and Jennie would make it to the countryside, but they would later be sold out by Dalek collaborators and taken to the camps. Ian meanwhile after the attack on the saucer had managed to stow away on the Dalek saucer, alongside another rebel. The two made it to the main Dalek camp, where after an encounter with the Black Daleks most vicious pet mutant, the Slyther, Ian was able to climb up the Daleks main shaft to their base. Whilst in their base, Barbara would discover the Daleks key weakness. They controlled all of their robomen with a single speaker in their headquarters. Barbara tried to take control of it and give the robomen new orders to turn on the Daleks, but sadly she failed and was captured again. The Doctor meanwhile, working with Susan and a small group of rebels figured out what the Daleks were planning and sent Susan and a rebel named David to tamper with the Daleks main power source. The Doctor knew from his previous experience with the Daleks that monsters couldn’t leave their metal city without the power dishes on their back. Susan and David were able to sabotage the Daleks power source, causing the Dalek machines to break down all over the world, whilst the Doctor with the aid of the rebels infiltrated the Daleks base and rescued Barbara. The Doctor would then give the robomen new orders to turn on and destroy the Daleks. All over the world robomen started to attack the now vulnerable Daleks who had been rendered immobile thanks to Susan and David’s actions. Several of the Daleks human slaves in the camps seized the opportunity and joined in attacking their former masters. Whilst the Daleks were being slaughtered by their own servants, Ian who had managed to crawl up the shaft they had intended to send their bomb down into the earth’s core, blocked up the shaft. When the bomb went off it destroyed the Dalek headquarters, with the Doctor, Ian, Barbara, and Susan having managed to get the slaves to safety first. Most of the Daleks were killed in the blast that consumed the headquarters, whilst the few survivors around the world were killed off by their own robomen, or died as a result of their power being sabotaged by Susan and David. Mankind was free for the first time in 30 years thanks to the Doctors actions. Whilst the Doctor, Ian and Barbara prepared to leave, Susan had fallen in love with David during their adventure against the Daleks, and the Doctor, not wanting to stand in his grand daughters way. Told her to stay with David and build a new life on earth, her favourite planet before leaving in the TARDIS. After saving humanity from the Daleks, the Doctor bids Susan farewell. With the Daleks plans to transform humanity into a weapon gone, the Daleks were forced to retreat from the Mechanoids and their allies. The weaponized earth was their last hope, and now they were completely outnumbered by their enemies. The Daleks retreated back to Skaro, with their empire now having been almost completely destroyed. Over the course of the 23rd century mankind would rebuild his devastated planet. It would take over 70 years for humanity to rebuild its cities and develop fully functioning societies again. Mankind was assisted in rebuilding by the other surviving races of the Federation, their allies and also the Therons and the Treens who felt guilty at not being able to help the earth from the Daleks during their rule. Life on Venus had been hard during the Dalek’s rule. Many of the Treens had come to blame the Therons for their predicament arguing that if they had still been under the Mekon’s rule then they would have been strong enough to fight the Daleks and defeat them. This would eventually lead to a civil war on the Treens side of the planet between the Mekon loyalists who believed they should try and find their former leader to lead them into battle against the Daleks, and those who still wanted to work with the Therons. The war killed millions of Treens and devastated entire cities, with the Theron loyal Treens eventually winning out. In addition to this it took so much energy to power the forcefield that protected Venus from the Daleks, that there was very little power left over for anything else, forcing the Therons and the Treens to scrape on very few resources. Overpopulation on Venus prior to the Dalek invasion of earth also meant that Venus had become dependent on trade from other worlds which resulted in a mass starvation on the planet too. Although they hadn’t been invaded by the Daleks themselves, Venus was still left utterly devastated as a result of the Dalek invasion of the solar system, with 100s of millions of Therons and Treens having died from the combination of the wars and famine. Venus would need help itself to recover, but still even in its most desperate times, it would still supply aid to the earth in order to make up for its past inaction. Susan would also play a key role in helping the earth rebuild. Her advanced Time Lord intellect helped humanity to develop terrorforming equipment far more advanced than before. Susan eventually married David and had two children with him in the early part of the 23rd century, John and Gillian. As John and Gillian were half Time Lord then they aged much slower than any human would, and so their father passed on before they were even teenagers. The two were still teenagers in the 2270s, despite being born in the early 23rd century. In addition to help from other species, some pieces of technology from the Daleks had been left on the earth and other worlds after their invasion, and it would be salvaged and used to not only rebuild humanity, but advance it in some respects to greater levels than ever before by the 2270s. The Mechanoids meanwhile were left devastated after the war with the Daleks. It would be their former allies however who would turn on the Mechanoids afterwards that would completely destroy their empire. The various races who had worked with the Mechanoids and the surviving worlds of the Federation against the Daleks, knew that the Mechanoids were an evil, pitiless race of conquerors in some ways no better than the Daleks. With the Mechanoids now at the weakest they had ever been, the allied planets didn’t want to waste a golden opportunity to eliminate this potential threat and so they turned on and attacked the Mechnoids. Completely unprepared and weak, the allied worlds were able to destroy what was left of the Mechanoids empire in no time and the few surviving Mechanoids would be forced to flee across the universe to try and rebuild. The Mechanoids would keep Steven Taylor prisoner for several years and perform various experiments on him in an effort to try and create a weapon to use against not just humanity but humanoid life forms in general. They managed to master several mind control techniques and even planted false memories in Steven’s head of the Mechanoids being simple service robots. The Daleks and the Mechanoids would fight one another whilst Steven managed to slip out. The Doctor left behind a bomb which destroyed the entire Mechanoid city on the planet, killing all of the Daleks and Mechanoids. The Doctor would then use the Dalek time machine to get Ian and Barbara back to their own time, whilst Steven Taylor joined the Doctor as his new companion. The new Federation would be made up of the survivors of the old Federation and their former allies against the Daleks who together made up a larger power than the previous Federation ever was. At first humanity was a small influence in this Federation but that would change over the next century. In the early 2270s, Dan Dare would be revived from his cryogenic suspension. Thanks to the influence from various other worlds, humanity now had the technology to treat his injuries, though in order to do that they had to reconstruct his entire face, giving Dan a totally different appearance from before. Captain Dan’s new appearance after the reconstructive surgery. 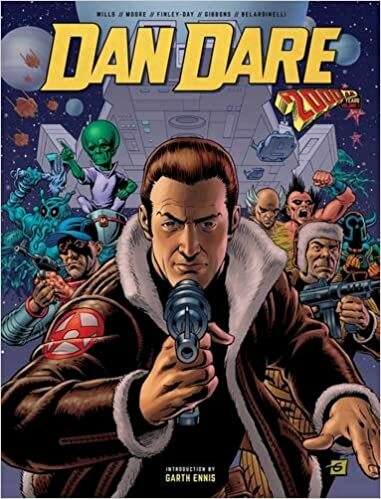 Dan Dare was revived more as a piece of propaganda than anything else. The new global government that had seized power after the Dalek invasion hoped that Dan, seen as the icon of the greatest era in human history could help win the people round. From the start however this plan would backfire on them. Dan frequently clashed with this government that was far more ruthless and xenophobic. Still throughout most of the 2270s, Dan would nevertheless serve them in the battle against the Daleks. Skaro had been forced to flee across the universe from the new Federation who wanted to crush the Daleks power completely. It eventually settled in a distant galaxy where the Daleks would begin to build up a small power base. However one of the races the Daleks had conquered would send out a distress signal that would be picked up by the Federation who were able to surround and corner the Daleks. The Daleks were outmatched by the new Federation, but they were able to build up a strong defence against them. The war waged on for a few years, and the Daleks came close to developing a weapon that would have allowed them to destroy the Federation. The weapon was designed to control the magnetic field in the milky way galaxy which would have allowed the Daleks to rip apart space ships and even planets from a distance. The monsters had been working on the weapon on Skaro for many centuries, even before the end of their invasion of earth. Susan had become disenchanted with the new earth government like Dan, but she still agreed to help them as the Daleks were obviously a greater evil. After the Daleks super weapon was destroyed, Susan and Dan would be hailed as heroes back home. Sadly the earth government would attempt to capture Susan and her two children. It hoped to discover what type of alien Susan was, with the earth government having become hostile to all unfamiliar aliens as a result of the Dalek invasion. Susan decided to flee into deep space. She wasn’t scared for her own safety, but had to put her children first. Dan understood and he only stayed behind to try and expose more of the government’s dodgy dealings. The short war with the Daleks eventually came to an end in the year 2277, when the Daleks were attacked from within by an old enemy, the Thals. The Thals had been forced underground by the Daleks many centuries ago just before the metal monsters had begun to build up their empire. The Thals had waited underground for the right time to strike, and now with all of the Daleks efforts spent simply defending themselves from the Federation, the Thals were able to strike at the monsters city. Catching them off guard they destroyed the Daleks main power source, causing all of their machines to break down. The Daleks were put into a state of suspended animation. Back on earth there was almost a universal support for the Daleks to be exterminated whilst they were vulnerable. Ultimately the other worlds in the Federation did not want to carry out a genocide, and so they instead simply quarrantined Skaro off to prevent anyone from ever reactivating the Daleks. The Thals meanwhile would try and rebuild the surface of their world. In 2279 earth would be invaded by a race of hostile alien monsters known as the Biogs. The Biogs originated from the planet Zicron and their machines and weapons were made of flesh. They travelled the universes assimilating other creatures into their technology. They were commanded by the Mother Biog. The monsters were directed to the earth by Dan Dare’s old archenemy, the Mekon. The Mekon’s empire had by this point crumbled and the monster sought to make the Federation its new base of operations. The Mekon hoped that the Biogs would be destroyed by the combined forces of the Federation, but not before greatly weakening them, allowing the Mekon and his Treens to then emerge and take over in the aftermath. The Biogs would set up their base on Jupiter which they prepared to attack the earth from. Dan however would be the first to discover its presence after losing a ship to the Biogs. At the time the head of the Space Corps accused Dan of losing the men through his own incompetence. They did not believe that there could be any life on Jupiter. They also did not particularly like or trust Dan, even with his status as a hero after foiling the Daleks with Susan. Dan Dare constantly questioned the Space Corp and the earth government’s methods. The head of the Space Corps was really looking for any excuse to get rid of Dan. Dan would stow away on board another vessel passing by Jupiter called the Odyssey. which was piloted by a 5th generation Martian named Monday. Monday’s people were the descendants of the original earth colonists on Mars from the 21st century. Their colonies had been destroyed during the Dalek Invasion of Earth along with most of the of the rest of the earth colonies. A few of the human settlers on Mars however had managed to survive on the planets surface (which had long since had oxygen restored to it.) But they would be forced to live a desperate and nomadic existence throughout the years of the Dalek occupation of earth. In the last 70 years they had managed to rebuild, but centuries of living on Mars had altered their bodies somewhat to be larger and stronger. Monday discovered Dan not long after they had taken off, but fortunately the Martian was more open minded than those in the Space Corps and he took Dan’s warning seriously. Dan and Monday, working together would battle the Biogs, but the monsters proved to be too powerful, and all of Monday’s crew but Dan, Monday, and Doctor Ziggy Rodan were devoured by the mutants. The Space Corp would send a fleet to try and destroy the monsters, but they were all effortlessly destroyed by the Biogs. Monday however would manage to pilot the Odyssey straight into the heart of the Biogs mothership which managed to force it into the sun. Sadly however Monday was unable to escape in time and he too was consumed in the sun. Monday bravely sacrifices himself to save the earth from the evil Biogs. Back on earth Space Corps refused to reinstate Dan, or even acknowledge he been right about Jupiter, much to Doctor Rodan’s anger. Doctor Rodan and Dan would begin a relationship with each other that would last for a few more years until her apparent death. Dan had suspected that the Biogs had been led to earth and with the help of a Werewolf named Rok he was able to track down the true culprit, the Mekon. After the failure of the Biogs invasion, the Mekon had teamed up with the notorious Two of Verath. The Two of Verath were two of the worst criminals in the galaxy who were fused together as a punishment. Prior to being joined together, the two were sworn enemies. One was a sadistic mass murderer, and another was a ruthless eugenicist. The two had since taken over a planet on the outskirts of the Federation where the worst criminals and the scum of the galaxy came to live. The Mekon intended to send the Two to attack the dominant race of the Federation’s homeplanet, where once they killed the Two, the bomb would go off. With the head of the Federation destroyed, the Mekon believed that it would throw the Federation into anarchy and allow him to take control in the aftermath. Dan and Rok were able to make their way to the Two’s headquarters. Whilst they were able to discover the Mekon’s plan, they were not able to stop him from hypnotising the Two. The Mekon at first did not recognise his old enemy, but after scanning his mind he discovered the truth and tried to feed Dan Dare to maggots! The Mekon and Dan Dare meet for the first time in almost 200 years. Dan however was able to escape with Rok’s help but they were too late to stop the hypnotised Two from making their way to the planet. However the Mekon had greatly underestimated the inhabitants of the planet who were able to free the Two from the Mekon’s mind control and send them back to the Mekon. Dan would subsequently form an alliance with the Two to destroy the Mekon. The Mekon saw through their ruse however and tried to murder the Two. To the former rule of the Treens surprise however, he discovered that the criminals on the Two’s adopted planet were genuinely loyal to the Two and defended him from the Mekon. In order to escape the Dare, Rok, the Two and the hordes of criminals out for his blood, the Mekon literally tore the small planet apart. Dan and Rok were able to escape, whilst the Mekon placed a forcefield around himself to survive. The Two however quickly threw themselves into the Mekon’s forcefield in time and survived the planets destruction. The Mekon and the Two of Verath were left floating in space together. Both wanted to kill the other, but sadly neither could for now. If the Mekon killed the Two he would explode, whilst if the Two killed the Mekon the forcefield would collapse and he would be killed by the vaccum of space. The two villains agreed to call it a truce for now. The Mekon’s forcefield would eventually make its way into the Federation’s missile silo in space. The two villains were quickly abducted by the Federation security, but the Two was able to turn the tables on their captors by threatening to shoot himself which would have set the missiles off, destroy the neighbouring solar systems. With no choice the Federation were forced to surrender their missiles to the Mekon and the Two who would use them to devastate several worlds in the Federation as a demonstration of what would happen if the rest of the Federation defied them. The Mekon and the Two would be forced to go on the run again. They would eventually be found by some of the few surviving Treens from the Mekon’s old empire. Though he now had the upper hand Mekon did not kill the Two. As much as they despised one another the Mekon and the Two realised that they were of use to one another for now. The Two had connections via criminals all over the Federation that would be of use to the Mekon and his Treens. The scientific side of the Two alongside the Mekon would create a virus that attacked Rok’s people. The race of Werewolves Rok belonged too had spent centuries controlling their bloodthirsty urges unlike other Werewolves across the universe which was why they had been fully integrated into the Federation. The Mekon and the Two’s virus however was like rabies in that it completely drove the Wolves mad causing them to degenerate into animals, savagely attacking one another and various other life forms across the Federation, spreading the curse of Lycanthropy further. The Mekon contacted the leaders of Rok’s people and said that they would give them the cure as long as they handed Dan, Rok and Doctor Rodan over to them. The Mekon and the Two would next track down the last of the Cosmobes. After the Dalek invasion all of the Cosmobes who had remained on earth had been exterminated. Most of the Cosmobes remained throughout the invasion as they did not want to leave humanity to suffer, but a few realized that it was pointless and fled to the outskirts of the galaxy. These Cosmobes were derided by the rest of the Federation as cowards and traitors and were generally seen as second class citizens in the Federation and were shunned by most of its other inhabitants. The Mekon would ally himself with one of the Cosmobes who was desperate to make the rest of the Federation pay. The Mekon and the rogue Cosmobe would together create a weapon that could dry up all of the waters on each world. The weapon had been invented by the Cosmobes at an early point in their history when they like many other races warred with each other. Whilst the weapon had long since been demolished, the rogue Cosmobe however believed he could rediscover the formula and with the Mekon’s help he managed too. The Two’s various criminal connections allowed the villains to deposit this weapon on various worlds around the Federation leading to a massive loss of life. Fortunately however Dan, Rodan and Rok, working with the Cosmobes, tracked down the Mekon and destroyed the weapon. The rogue Cosmobe would be betrayed by the Mekon who abandoned him to be captured. Over the next few years, Dan, Rodan and Rok would continue to track down the Mekon and the Two’s criminal minions and enterprises all over the entire Federation and shut them down before finally facing the Two and the Mekon at their headquarters. In the confrontation the villain’s headquarters were destroyed and both Doctor Rodan and the Two were seemingly killed in the explosion, whilst the Mekon and his few surviving Treens fled into deep space. Dan was left utterly devastated at Rodan’s death and with the Mekon gone, he now lacked a purpose and would spend the next few years in solitude whilst Rok returned to his people. In truth however Doctor Rodan and the Two had survived. They had managed as the base was blowing apart to escape into a capsule which was then blown off course and drifted outside the Federation’s reach to a primitive planet. Rodan meanwhile would flee the Grystroks and aid the race they were persecuting, the peaceful Lias for the next decade. In the year 2285, an earth prison ship named the Starfinder would crash land on Skaro near the abandoned city of the Daleks. The ship contained two prisoners, one of whom named Ladiver had been arrested for breaking the quarantine and visiting Skaro a few years prior. Not long after the ship crashed, the Daleks were reactivated by a member of the crew and began to slaughter them one by one. The captain of the vessel, Redaway initially believed that Ladiver was the traitor, but the two were quickly forced to work together to fight off the Daleks. Redaway was eventually captured by the Daleks however who brutally tortured him to death. Redaway is tortured by the Daleks. During the torture session he was able to discover the identity of the real traitor. Sadly though Ladiver was able to rescue Redaway, he died of his wounds before he could tell Ladiver the truth. Ladiver soon discovered that the traitor was in fact a member of the crew rather than a prisoner, Bob Slater who hoped to use the Daleks as his army to conquer the Federation. Slater had reactivated the Daleks using several devices that he placed on their backs. If the Daleks disobeyed him then he could simply deactivate them again. The Daleks pretended to be docile servants for Slater, but in secret they were able to reconnect their power source. Slater watched in horror as the devices fell off the Daleks backs and his former “servants” turned on and killed him. The Daleks prepared to begin their war against the Federation again, but Ladiver was able to escape their city and warn the Thals. The reason Ladiver had visited Skaro was to be with his lover, a Thal woman named Ijanya, who he had helped defeat the Daleks years ago. Whilst Ladiver distracted the Daleks, Ijanya was able to deactivate the monsters power source, putting them out of action once again. Before he was put into a state of suspended animation, the Black Dalek vowed Ladiver that they would return. The Daleks are shut down a second time by the Thals. The survivors of the Starfinder would return to earth, where Ladiver would be pronounced dead, allowing him to stay on Skaro with Ijanya. Sadly Ladiver and Ijanya’s life together would not be a happy one. A few years after the defeat of the Daleks Skaro would be invaded by a race known as the Moroks. The Moroks were an emerging space power from just outside the Federation. They conquered Skaro relatively easily. At first the Federation attempted to defend Skaro in case the Moroks tried to reactivate the Daleks. The Moroks however soon made an alliance with the Federation. The Moroks would destroy the Daleks and conquer the Thals if the Federation left them alone. The heads of the Federation agreed. By this stage earth and various other races who had suffered under the Daleks had gained a greater influence in the Federation and they had trouble with exterminating the Daleks. They had still been prevented however from doing so by the Thals who did not want to carry out a genocide. Even though the Federation were far more powerful than the Thals, they did not wish to set a dangerous precedent of larger powers imposing their will on smaller planets. However the Moroks who were seen as evil conquerors could do the Federation’s dirty work for them and wipe out the Daleks after which they would “negotiate” a peace treaty for the public. Ladimer was given a warning by a friend of his in the Federation that the Moroks would invade and humanity would be happy to let them have the Thals. 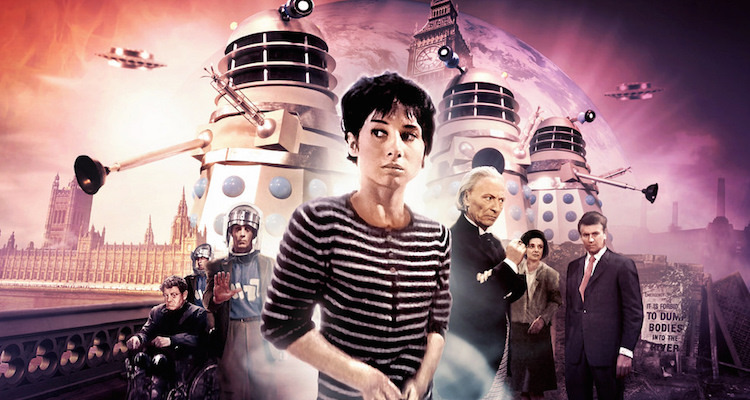 With no other choice, Ladimer and Ijanya would lead a team to rescue the Daleks from the city. The Thals were no where near advanced enough to take on the Moroks. The Daleks were their only hope. A small group of Thals were able to hold the Moroks off long enough for the Thals to get most of the Daleks safely underground. The Thals reactivated the Daleks underground, though much like Slater it was in a way where they would shut down the Daleks if they turned on them. The Daleks would reluctantly work with the Thals to fight the Moroks for many years. Eventually however even with their limited resources the Daleks were able to develop their own power source, but they still worked with the Thals, as neither could stand against the Moroks. The Moroks outnumbered both the Daleks and the Moroks greatly and were able to slaughter their small armies. One of the Daleks killed during the Morok’s invasions casing was later placed in the Morok’s museum of greatest triumphs. The Moroks would make a fatal mistake at the start of the 24th century when they unknowingly released Davros’ Daleks from their prison. These Daleks were far more advanced than Zolfian and Yarvelling’s Daleks but they had been sealed beneath a mountain for several thousand years by the actions of the Fourth Doctor. With only limited resources the Daleks were completely trapped below ground with neither the original Daleks nor the Thals even being aware of their existence. The Morok’s however detected the old Kaled bunker below the ground and thinking it was a secret Dalek base they blasted their way there. As soon as they made their way in however Davros’ Daleks fought back and were able to slaughter the Moroks. Davros’ Daleks were more powerful than the Moroks as they could power themselves and fly. They wiped out the entire Morok invasion force relatively quickly and then turned their attention to the Thals. Davros’ Daleks, just as they had done thousands of years ago slaughtered the Thals. The Zolfian and Yarvelling Daleks sided with Davros’ Daleks, despite having worked with the Thals for years, they showed no clemency to them. Most of the Thals were exterminated but a few led by Ijanya managed to escape to another world. The Thals had not mastered spaceflight yet and would not do so for the next couple of hundred years, but they were able to capture a Morok spaceship and force its occupants to take them across the universe to another planet. The surviving Thals fled beyond the Federation’s area of space as they no longer trusted humanity. They would spend the next several centuries building themselves up to strike back at the Daleks. Back on Skaro Davros’ Daleks would force Zolfian and Yarvellings Daleks to further mutate themselves in order to match Davros’ Daleks, and they upgraded their casings to be more powerful and capable of powering themselves too. The leader of the Zolfian and Yarvelling Daleks, and Davros’ Daleks would then merge together into the one entity, who would become the new Emperor of the new unified race of Daleks. 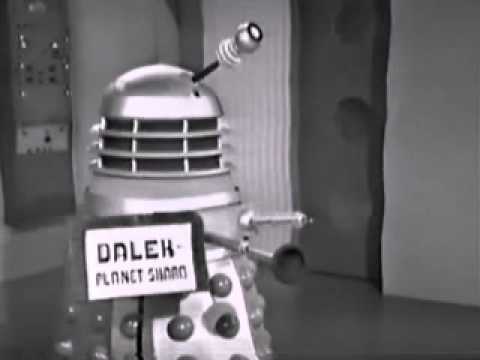 The new unified Dalek race would pilot Skaro out of the Federation and Morok’s reach into another galaxy. Despite how advanced and powerful they were, they were few in number and so they needed to regroup. The Federation would search for Skaro, but it travelled far beyond their reach, where the Daleks would over the next 100 or so years build up a new empire, far larger than the original as well as discover time travel. 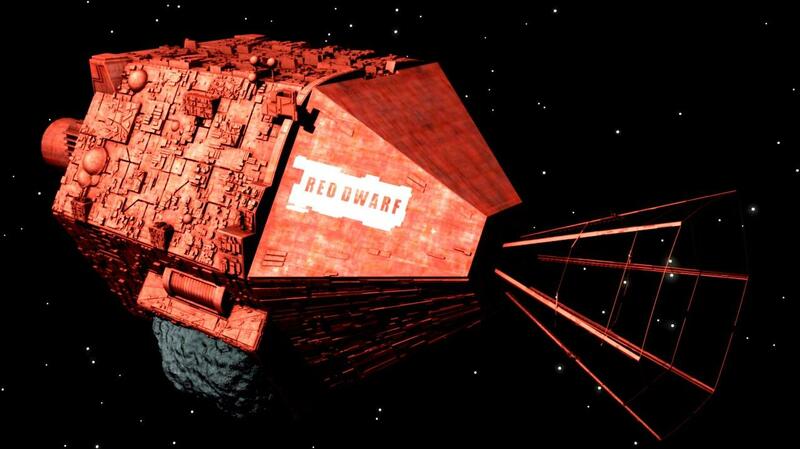 In the year 2292 the legendary Jupiter mining corp ship Red Dwarf would become lost in space. Red Dwarf carried a crew of over 1000 people when a radiation leak caused by a faulty drive plate killed all but one of its crew, the lowest ranking technician, Dave Lister. Dave Lister had been put in stasis, a special kind of suspended animation for a few months as a punishment for smuggling his pet cat, Frankenstein, on board. Whilst Lister was in stasis, the second lowest technician on board the ship (and Listers bunk mate) Arnold Rimmer failed to fix the drive plate properly, leading to the destruction of the crew. The radiation leak was so great that no earth crew could board Red Dwarf to rescue Lister and so it would be forced to drift through deep space, piloted by its sentient computer Holly for over 3 million years. Red Dwarf would eventually drift into the galaxy where the humans who had earlier fled from the Dalek invasion of earth had escaped too. By the time Red Dwarf arrived there however, almost all of the humans had been killed off by the Gelfs and the Simulants who were now the dominant life forms, though a few stray Mechs and other man made creatures survived. On Red Dwarf itself however there would be one other survivor besides Dave Lister. His pet Cat, Frankenstein was stored safely in the cargo hold of Red Dwarf away from the radiation. Frankenstein was pregnant and she and her kittens descendants would eventually over the course of 3 million years evolve into a race of intelligent cat people called the Felix Sapiens. The old and the sick were left behind to die on Red Dwarf, with eventually only one young male remaining. Dave Lister would be awoken from stasis three million years into the future (with only seconds having passed for him.) By that stage Holly, who gone somewhat peculiar due to the millions of years of solitude, had revived Arnold Rimmer as a hologram to accompany Dave Lister. Hologram technology had been revived in the later part of the 23rd century before Red Dwarf had become lost. This technology however was more basic than that before the Dalek invasion, but it was now more common, with various space ships having their own hologram member. It would be discontinued at the start of the 24th century however with the government believing it was ultimately too expensive and pointless as the demand for more and more holograms was growing at that point. Rimmer and Lister along with the last Cat person on Red Dwarf (who Lister came to simply name The Cat) would later discover an abandoned Mech named Kryten and together the 4 of them would go on various adventures in deep space together, though we will be looking at the history of the Dwarfers in greater detail later. In the year 2294 Dan Dare would be sent on a mission to explore an uncharted area of space that the Federation had attempted to colonise many times before, only to lose all contact with the colonists each time. The mythical lost worlds. The mission was seen as suicide, but Dan still eagerly accepted. He had spent years in solitude grieving for Doctor Rodan, but now he was eager to resume his career. Sadly however his public clashes with the government meant that no one would hire him. The Lost Worlds was the only possible chance he could get to be the captain of a vessel again and so he took it. Dan knew given the Lost Worlds reputation that no one would willingly venture into the Lost Worlds, so he was forced to make his crew up of some of the worst criminals and outlaws in the Federation. Whilst this would later lead to problems, with one of the criminals attempting to overthrow Dan and leading a mutiny. Two of the criminals, a large brutish man nicknamed Bear and another nicknamed Gun (as he had a gun built into his hand) would become two of Dan’s best friends. Dan would travel the Lost Worlds in a gigantic space fort, with a scout ship christened the Eagle. Dan’s mission was actually to try and find any survivors of the recent colonies that earth had established on the outskirts of the Lost Worlds, but which much like the Federation’s previous attempts to colonise the Lost Worlds, they had lost all contact with. It wouldn’t take Dan long to discover that there were no survivors on the outer planets, but he would continue to explore the Lost Worlds right up until the early 24th century. Dan would explore more of the Lost Worlds than anyone before him. Among his most notable adventures in the Lost Worlds included his adventure on the Sand World of Vern. On Vern the Sand was not only alive but it ate flesh. An entire earth colony that had settled on the planet, believing it to be uninhabited were consumed by the living sand. When Dan arrived to investigate, several of his men would be devoured by the killer Sand, and his ship would be trapped in a sandstorm. Dan however would be able to escape the Sand planet by using his ship to affect the atmosphere, making it rain which weakened the Sand enough for it to loosen its grip on Dan. Dan would also encounter a planet of Vampires. The Great Vampires many eons ago had travelled to the Lost Worlds. They had destroyed most of the worlds they had visited, but on this planet a few lesser Vampires had survived and would do so long after their creators were slain by the Time Lords. For thousands of years these monsters lured passing ships to their world and slaughtered their inhabitants. They slowly built up a small population of captured aliens who served as their regular food supply. These aliens would be broken down emotionally by the Vampires through constant torture to ensure that they would never turn on them. Whilst the alien population served as a regular food supply, the monsters still love luring passing ships and hunting less docile and easy victims. The Eagle would be lured down to the planet, with the Vampires pretending to be a peaceful, yet somewhat primitive society at first. The first night they spent there however, Dan would discover the awful truth when two of his men were lured away by two Vampire girls who ripped their hearts out. More of Dan’s men would be slaughtered by the Vampires, but they managed to fight their way out past the monsters and back to the Eagle. Dan Dare and his men battle the Vampires of the Lost Worlds. By far and away Dan’s greatest exploits in the Lost Worlds were his battles against the Star Slayer empire. The Star Slayers were the biggest power in the Lost Worlds, having conquered hundreds of worlds. It would take Dan many years to bring down their empire, but he managed to convince many of the worlds in the empire to rebel, and succeeded in killing the Star Slayers ruler, the Dark Lord in a duel. The Dark Lord, Dan’s nemesis during his time in the Lost Worlds. Sadly Dan’s adventures in the Lost Worlds would come to an end when his crew encountered Moebius. Moebius belonged to a highly advanced race known as the Golden Ones. Moebius’ crew had decided to explore the universe, but unfortunately a plague had killed all of the crew except for Moebius himself who had downloaded his mind into a computer. Moebius would continue to pilot the ship through the galaxy, but it eventually developed a mind of its own and began capturing various races and destroying entire worlds. Moebius desperate to stop the destruction would abduct Dan and his team in the hopes that they could finally destroy the ship from within and save countless worlds. Though Dan managed to destroy the ship, sadly all of his crew were killed in the process and his fortress was destroyed. Dan would be left floating in space until he was eventually found by his old archenemy, the Mekon. The Mekon had travelled to the Lost Worlds many years ago to escape the Federation. He felt it was the perfect place to begin a new empire. His Treens were able to conquer a few planets and used their resources to build various weapons. However their plans to become a major force in the galaxy were hampered when the Mekon fell ill.
Mekon’s were genetically engineered to live for centuries, and this Mekon, the last of his kind was nearing the end of his natural life span. The Mekon would pull all of his Treens efforts into trying to find a way to prolong his life. They soon learned of the existence of the Crystal of Life, a powerful artefact, created from a star. When the Mekon first discovered Dan he simply intended to torture and kill his archfoe, but when his attempts to make Dan relive the most painful moments from his life instead made the former pilot amnesiac. The Mekon decided to use Dan as a pawn to help him retrieve the Crystal instead. The Mekon had also imprisoned Sondar (who had settled in the 23rd century after his adventures with the Doctor.) Sondar would escape however and manage to restore Dan’s memories, but unfortunately by that time Dare had done everything the Mekon had wanted, and the former Venusian tyrant was able to acquire the crystal. The Mekon would gain immortality from the crystal and become far more powerful than ever before. Armed with his new powers and abilities the Mekon would return to our galaxy. Despite having originally repressed his emotions, the Mekon had learned how to hate over the centuries. 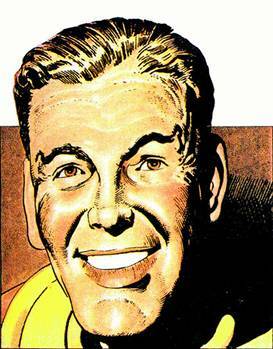 He despised not only Dan Dare but all of humanity too, and wanted to make them all suffer. Dan and Sondar followed the villain back, but the Mekon prepared for them. He hired a shapeshifting Krulgan to impersonate and frame Dan. This Krulgan was actually a former enemy of the Mekon during the wars, but since the collapse of his empire he had resorted to being a mercenary in the Federation’s area of space. The Krulgan assumed Dan’s form and framed him for a high profile murder in the Federation. Dan and Sondar would be forced to go on the run as they tried to hunt the Krulgan down and clear their names. When they finally found the monster, it was killed by a a warrior woman named Morag, using her pet alien that resembled a Pteranodon! Morag’s people had been enslaved by the Krulgans and her husband had been killed by the Krulgan that had framed Dan and Sondar. For the next few months, Dan, Morag and Sondar would work together to try and bring down the Mekon but not only did the villain cover his tracks well, but the trio were constantly being hunted by the Federation. Dan would be forced to undergo more reconstructive surgery to change his appearance once more. Dan’s new appearance after his reconstructive surgery. The Mekon would destroy the government on earth with his new weapon and took control of the earth after defeating the earth’s armies in the year 2304. The Mekon was aided by several Treens on Venus, who even after all this time still remained loyal to the former tyrant. The Mekon’s second occupation of earth would only last for a few months. He did not devastate the planet in the same way as before. Cities were left largely intact. Still the Mekon’s rule over the population was brutal and over 500 million people would be slaughtered by the villain, more than both World Wars combined. Most of his rule was spent trying to defend the earth from the new Federation. He would force his human slaves to help build weapons that he hoped could devastate the other worlds of the Federation. Dan, Morag, and Sondar working with the other worlds of the Federation would infiltrate the Mekon’s base on earth and drive the monster off the earth. The Mekon would go on the run with his loyal Treens and Dan, though this time he would not be able to escape the Federation’s area of space. He would remain the most wanted fugitive in the Federation for the rest of his life. After saving the earth Dan, Morag and Sondar would be approached by the 13th Doctor to accompany him to the 31st century for an important mission. After being returned to their own time, they would later go their separate ways. Morag to try and find more of her people, and Sondar to try and help Venus recover from the Mekon’s actions. Dan’s Eagles consisted of Tremloc, a benevolent Treen mutant, Velvet O’Neil, a member of a race of aliens known as the Scouran and Andy Zapper Lawrence, a human who had been flung forward from the 20th century. Dan naturally could relate to Zapper and would take on a fatherly role to young boy. Dan’s Eagles would have many more battles with the Mekon and his Treens as well as various other threats to the galaxy over the next few years. Towards the end of the 2300s, Dan would finally discover that Rodan had survived and would aid her and the Lia’s to finally drive the Two of Verath off Glasias. Rodan and Dan would later marry in the early 2310s. Their relationship was long term for a while however as Dan continued to try and track down the Mekon (and the Two), whilst Rodan would continue to help the Lias rebuild their world. However whilst Dan’s name was cleared and many would come to regard him as a hero again, he still clashed with the Earth government all the time. The new earth government established after the Mekon’s second invasion of earth was even more hostile to aliens, and was desperate to make earth a major power that could never be invaded again. Over the course of the next 50 years, the earth would slowly begin to undermine other powers in the Federation to the point where it would become the dominant power in the Federation. The primary reason for this was the establishment of the super computer, Control in the year 2320. Control would allow mankind to terrorform planets to a greater extent, control the weather on certain planets, and power more advanced weaponry than other worlds in the Federation. Slowly but surely humanity would begin to stamp their will on their former allies. In the early 2310s The Mekon would discover the secret of time travel and attempted to change history so that his first invasion of earth was never repelled. Though Dan foiled the Mekon’s plan, the villain would continue to try and perfect his time machine. His experiments however ended up creating ripples throughout the time vortex which threatened all of time and space, eventually drawing the Time Lord’s attention, who quickly sent the 10th Doctor in to deal with the problem. The 10th Doctor his companions, Elena and Yarox, as well as Crypto 245 and of course Dan Dare himself would work together to stop the Mekon’s time travel experiments from destroying the universe. At this stage the last of the Furons had been reduced to nothing but intergalactic nomads, travelling from world to world, desperately trying to survive. Still despite Orthopox not wanting to draw attention to their race now that they were vulnerable (and many species wanted revenge.) Crypto’s hatred for the Mekon eclipsed everything else, and he was determined to make the monster pay for destroying his people. Working together, the Mekon’s archenemies were able to destroy his time machine and seemingly kill the green skinned tyrant once and for all. With the Mekon gone, Dan would settle down with Doctor Rodan for many years. He became a recluse for a while, disgusted with what the Federation were doing, he would later aid various resistance groups making him an outlaw. Dan and Rodan would be forced to flee to an area of the Federation, still not under humanity’s control with the two being branded as traitors back on earth. Dan would make one last visit to earth’s area of space again however near the end of his life to do battle with his archfoe the Mekon for the final time in the year 2330. The Mekon had survived the Doctor, Crypto and Dan’s attack on his base, but he had been left badly wounded. The Mekon was saved by his few surviving Treen servants who placed him on an advanced life support machine that barely kept him alive. The Mekon had finally been driven insane by his latest defeat. Over the decades his hatred for humanity and Dare above all else had slowly over the decades dragged him deeper and deeper into madness, but now near death and in constant pain, the Mekon’s rage finally pushed him over the edge. The Mekon knew that he wouldn’t live for much longer in his current state, and so he sought to make all of reality pay. He couldn’t bare the thought of the universe going on without him. He was also bitter that no matter how hard he tried his empires had always fallen, and his enemies, humanity, had if anything been made stronger by his actions. The Mekon decided to rebuild his time machine, but this time he would turn it into a weapon. He would intentionally use it to rip apart the time vortex, which would not only destroy this universe, but all realities as well. The Mekon didn’t want to use it to try and go back to change his own history. Changing time in such a direct way was dangerous in N-Space, and even if he did manage to find a way to change things, the Time Lords would detect him and he was in no position to take them on. The Mekon no longer wished to conquer. He just wanted to tear everything down. With only a handful of Treens to help him, the Mekon formed an alliance with the Two of Verath and together the two villains would recruit human rebels as their new allies. The Mekon through hypnosis was able to take control of the leaders of the various human rebel groups which had previously always fought and made them steal pieces of equipment for his weapon. Even the Two of Verath was duped by the Mekon as he merely believed that they were building a time machine. The Two hoped to travel back and prevent being fused together. Under the Mekon’s guidance the rebels were unified like never before but they also became far more ruthless and began slaughtering civilians on certain colonies. Dan would be summoned to help by one of rebels he had worked with years ago named Kasta who suspected something was wrong. Doctor Rodan had sadly passed away in the year 2327, and since her death Dan had become somewhat reclusive and pessimistic. Still he agreed to help his former ally and the two would eventually discover the truth. The Two would also discover what the Mekon was really planning and turned on him, though the Mekon would in turn kill the Two. The Mekon was also able to mortally wound Dan, but before his death Dan would overload the Mekon’s weapon causing it to explode and finally destroy the former Venusian tyrant once and for all. Dan would be buried on the neutral world he had spent the last few years of his life on alongside Doctor Rodan by Kasta. Back on earth Dan would still be smeared as a traitor by the earth government and his heroic exploits in finally destroying the Mekon would be covered up by the government. He would be largely forgotten as a result for hundreds of years afterwards, but by the 31st century Dan’s exploits would once again be known to the public and he would become one of humanity’s most celebrated heroes. The Mekon’s influence on the resistance movement caused it to collapse completely. The earth government were able to smear all resistance movements as Mekon sympathisers. It would take decades for the resistance movement to recover. Over the next 60 years after the Mekon and Dan Dare’s death in 2330 mankind would come to completely dominate the Federation thanks to Control. All planets would either be ruled by humanity or at least become dependent on them. The Federation under humanity’s guidance would conquer thousands more worlds and expand like never before. A few planets would remain neutral, but throughout the 24th century most of our galaxy would be under the earth’s rule. Humanity would be utterly ruthless in stamping out all opposition in the most brutal way possible, ironically becoming no better than the Mekon himself. By the late 2370s the resistance movement had begun to recover and over the next 20 years it would score many notable victories against the Federation. The Federation in response would clamp down even harder on any form of resistance with Federation officers earning a reputation for brutality that would persist for hundreds of years afterwards. In the late 2380s the resistance movement was led by a man named Roj Blake who scored many notable strategic victories against the Federation and was able to win round more support for the resistance than ever before. The Federation however would nevertheless manage to capture Blake in the year 2390 thanks to the efforts of Space Commander Travis who Blake was able to grievously wound in the process, blowing off his arm and one of his eyes. Rather than simply kill Blake however the Federation brainwashed him to renounce the resistance on air. If they killed him he would have been a martyr, and so instead they brainwashed him into being a loyal citizen of the Federation. In the meantime the Federation would hunt down and slaughter almost all of Blake’s former allies. The Federation attempted to brainwash Blake once more, but his mind had built up a resistance to it, and he continued to renounce the Federation. Still not wanting to kill Blake and make him a martyr, the Federation would instead discredit him by brainwashing several children into believing that they had been raped by Blake. With his reputation completely destroyed, Blake was shipped off to the prison planet, Cygnus Alpha. Along the way Blake would attempt to take over the ship with the aid of several other criminals including Kerr Avon, a computer expert, Jenna Stannis, a smuggler, Vila Restel, a cowardly thief, and Olag Gan, an alien who had murdered a Federation guard that murdered and raped his wife. The attempted takeover however was quickly crushed thanks to Vila’s incompetence, but Blake, Avon and Jenna would get a second chance, when the prison ship stumbled across a seemingly abandoned gigantic alien spacecraft. The prison ship would send several guards to explore the ship, but they were all killed by its self defence system. Not wanting to lose any more men, the commander would send Avon, Blake and Jenna to the ship, promising to spare them if they found out what was wrong. Avon and Jenna nearly succumbed to the ships defence system, as it used illusions to draw its victims in, but Blake after his experiences with the Federation could recognise the illusions for what they were and destroyed the defence system. Jenna would then quickly pilot the ship away from the Federation. The alien vessel that Blake would come to christen the Liberator could move faster than any Federation ship and came equipped with a teleportation device. Blake would follow the prison ship to Cygnus Alpha where he would rescue Villa and Gan. Later Blake would recruit another ally, a young alien telepath named Cally. Cally’s people, the Auroni were a peaceful race who had been persecuted for decades by humanity. Together, Blake, Jenna, Vila, Cally, Avon, Gan and the Liberator’s living computer, named Zen would be known as Blake’s 7 and they would become the most notorious enemies of the Federation. The Liberator allowed them to outfight and outrun any Federation ship, whilst its teleportation system allowed them to infiltrate Federation bases and colonies like never before. The original incarnation of Blake’s 7. Blake’s 7’s most notable victory in the early years was stealing the super computer named Orac, who would become a member of their crew. Blake’s 7 were pursued in the early years by Travis, though in reality the greater threat came from Servalan, Travis’ superior. Servalan was the most vicious, power hungry and sadistic woman in the entire Federation. She was hated and feared by all of her superiors and those who worked with her. Whilst all of Travis’ efforts were spent trying to capture Blake (with the Federation wanting the Liberator to study in the hopes of mastering its teleportation system.) Servalan would slowly build up her power throughout the Federation’s ranks. In the year 2395, Blake would launch an attack on Federation control only to discover that it had been moved to a far away planet called Star One. 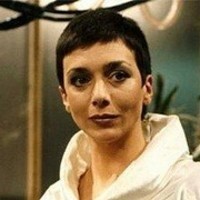 In the resulting confrontation with Travis and Servalan, Gan was killed and the crew began to lose faith in Blake. Things had always been tense between Avon and Blake. Avon did not care about Blake’s cause. In fact he felt it was pointless and that Blake would get them all killed eventually as he could never hope to win against an empire. Avon had only stayed with Blake because it was the safest option for him, but he regularly tried to undermine his authority. Still Blake would carry on as the leader of the group as he desperately tried to find the real location of control. After a year or so of searching, Blake was finally able to track down Star One. When he arrived at Star One however he discovered that Travis had beaten him there. Travis by this point had become an outlaw from the Federation as well for a massacre he carried out many years ago. Servalan had given him a pardon because she felt she could use him against Blake, but after the two’s failure had resulted in the secret of Control not being on earth being exposed, Servalan allowed Travis to be tried to take the heat off of her. Travis was driven insane by what he felt was a betrayal of the Federation and sought to make all of humanity pay. He had managed to contact a race of hostile shapeshifting aliens from the Andromeda galaxy who had sought to expand their empire into the Federation’s area of space. The aliens however had been kept out by Star One’s defence system, but Travis was able to give them the secret code to by pass the defence system, and infiltrate Star One. The aliens quickly slaughtered the humans sent to monitor Star One and prepared to destroy the base. Ironically Blake would now be forced to try and protect Star One from the aliens. As bad as the Federation were, the aliens planned to exterminate virtually all of humanity, as well as the other races under their rule. During a confrontation with the aliens and Travis, Blake was badly wounded. Avon was able to kill Travis, whilst Cally was able to dispose of all but one of the bombs Blake had placed around the base. The last remaining bomb shut down Star One’s defences, allowing the full alien invasion fleet to move in. With no other choice, the Liberator sent a distress signal to the Federation. Servalan had just managed to assume control of the Federation after staging a coup and she instantly dispatched her main war fleet to defend Star One. In the meantime the Liberator would hold off the aliens by itself. Avon was forced to lead the attack as Blake was still recovering from his wounds. A full scale intergalactic war would break out between the Federation and the aliens, with the Liberator fighting on the Federation’s side. The war lasted for several months and ended in the complete destruction of both the alien and the Federation fleets. In their final counter attack the aliens were able to destroy Star One completely. Though the aliens were defeated, the Federation’s power was completely crushed. Blake had seemingly won. Blake and his crew however would be forced to abandon the Liberator during the final days of the war, and both Blake and Jenna would subsequently become lost. Avon, Cally and Vila would return to the Liberator after the war, and they would pick up two new companions along the way, Del Tarrant, a petty criminal, and Dayna, a young weapons expert. Along with Orac and Zen they would make up the new 7 with Avon as the new leader in Blake’s absence. For the next year Servalan would desperately attempt to rebuild the Federation’s empire. She would become more fixated on capturing the Liberator and Orac, seeing them both as her way of reclaiming her former power. Avon ironically would take up the now missing Blake’s place as the leader of the resistance, though it was not for altruistic reasons. Avon enjoyed the freedom he had in the post Federation galaxy and was determined not to loose it. Sadly however after a year of leading the crew, Avon would make a fatal mistake when he took the Liberator through a dangerous fog in space in order to meet up with what he thought was Blake. In reality however it was Servalan who was tricking Avon in an attempt to get her hands on the Liberator. Whilst Servalan managed to outwit Avon and steal the ship leaving Avon and the rest of the crew stranded on Terminus (an unstable man made planet.) The fog Avon had brought the Liberator through ultimately destroyed the ship. Though Servalan was able to teleport to safety in time, she was left stranded on a far flung earth colony, during which she was overthrown as the President. Servalan would subsequently fake her own death, and go under the alias of Commander Sleer and slowly work to regain her power. The former crew of the Liberator meanwhile would run into trouble on Terminus. Cally was be killed by one of Servalan’s booby traps, whilst the others would struggle to survive against the dangerous creatures of the planet and in the freezing conditions. Eventually however they would be rescued by an immortal named Dorian, who kept himself alive for centuries by sacrificing innocent people’s lives to prolong his own. He intended to make the crew his new sacrifices, but Avon managed to kill Dorian, after which the former Liberator crew would adopt Dorian’s spaceship, Scorpio, and his headquarters as their own. Thanks to Orac, the crew would be able to adapt old Liberator technology to Scorpio including the teleportation system and the ability of the ship to go faster than any Federation vehicle. 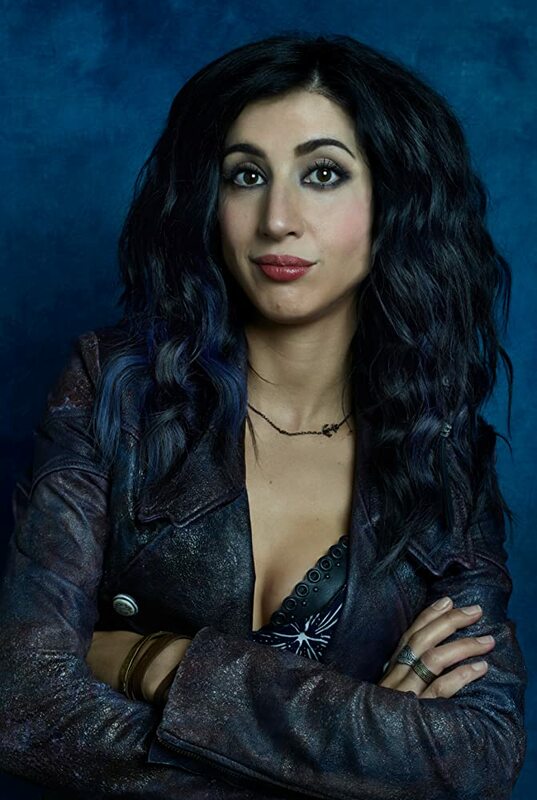 They would also take on Dorian’s former assistant and lover, Soolin, who he had also attempted to sacrifice as a new crew member to replace Cally, whilst Scorpio’s living computer, Slave, made up the new and final incarnation of the seven. Under Avon’s leadership the crew of the Scorpio would continue to fight the Federation for a year. Though they had many more notable victories, including stopping the Federation from acquiring the Tachyon Funnel, a planet destroying weapon developed by the rogue scientist Egrorian. The Federation was still able to slowly rebuild its power thanks to the help of a new mind controlling drug which they were able to spike the population of various worlds with. Avon needed a figure head to unite the various rebel factions together to strike back at the Federation and destroy it whilst it was still weak. Avon hoped that Blake could be the figure head. Blake had been stuck on the planet Gauda Prime, a rogue world populated by criminals for the past year or so. Jenna had sadly since departing from the Liberator been killed in a confrontation with Federation scout ships. All the time spent alone on Gauda Prime had made Blake bitter and paranoid and though he still wanted to destroy the Federation, he would make every single one of the people he recruited go through a test to see if they could be trusted where he would pretend to be a Federation agent. Sadly this would ultimately backfire on him, when Avon arrived. Scorpio was shot down on arrival by criminals. Tarrant had nobly stayed behind on the ship to pilot it whilst the others teleported down. He survived the crash only to be found by Blake on the ground below who performed his usual test of character on Tarrant. Unfortunately before he could explain what had happened, Tarrant escaped and told Avon that Blake had betrayed them. Before Blake could explain it to Avon, Avon shot him dead. Immediately after Blake’s death, his base was swarmed by Federation troops. Ironically one of Blake’s allies was in fact a Federation double agent. One by one, Dayna, Vila, Soolin and Tarrant were shot dead by Federation troops. Only Avon who had completely snapped from the realisation of what he had done, was left to face down the Federation guards in a last stand. In the year 2397, all of the members of the final incarnation of Blake’s 7, but Avon are slaughtered by the Federation. Avon was captured by the Federation who did not want to make him a martyr figure. Ironically Avon himself had become something of a figurehead to the resistance movement in Blake’s absence. Servalan, who had once again managed to seize power, gave Avon an ultimatum that if he publicly renounced the resistance and made out that Blake had been a traitor then she would allow him to live in exile. Avon was a totally broken man at this point and put up no resistance to Servalan. Avon would spend two years in exile, whilst Servalan, using Orac that she had managed to retrieve from where Avon left it on Gauda Prime was able to expand the Federation again to greater levels than before. Eventually in the year 2399, Servalan would decide to finish Avon off and sent assassins to kill him. Avon meanwhile who had recovered from his mental breakdown was able to kill the assassins and stole their vessel which he used to flee from the Federation. Avon knew it was pointless to try and fight the Federation again so he fled to the neutral city of Kaldor city beyond the Federation’s reach where he would remain for a few years, under the alias of Kaston Lago. Whilst on Kaldor City Avon would face the last of the Fendahl that had survived the Doctors attempts on it’s life in the 1970s. In the year 2407, Avon would help foil an invasion of Kaldor City by the Cybermen who wanted to use it as a launch pad for an invasion of the Federation. Avon would work with the 8th Doctor and Arnold Rimmer against the Cybermen. This version of Arnold Rimmer was a hologram from several million years in the future. He had left the crew of Red Dwarf to assume the identity of Ace Rimmer, a dimension hoping heroic alternate version of himself. At first he struggled however, but after joining the 8th Doctor he gradually became a more genuinely heroic figure, worthy of the title of Ace. Avon would subsequently join the Doctor and Rimmer, and the three of them would travel together for many years. Back in the 25th century meanwhile, Servalan would degenerate further in the later years of her rule. She became more paranoid, psychotic, perverted and reckless despite her earlier success. Servalan wanted to conquer the Lost Worlds area of space. Ever since Captain Dan’s mission to the Lost World’s the Federation had largely ignored the Lost Worlds out of fear. In the 2380s however they had attempted to establish colonies there, but just as before they had lost contact with them. Servalan would later in the year 2397 mount a rescue mission to Vern, the sand world in search of the one man she had ever loved. Whilst there she became stranded with Tarrant who she was forced to work with to escape. The records of Dan’s mission to the Lost World’s had been lost when all of his exploits were covered up by the Federation. However one team would make a mistake of landing on the Vampire planet Dan had visited a century earlier. One of the Federation troopers was infected by one of the Vampires and when he returned to the Federation, he would infect others, and eventually even Servalan herself would be transformed into a Vampire. Vampires had largely been driven to near extinction throughout the Mekon and Dalek invasions of earth. Both the Treens and the Daleks singled the bloodsuckers out as threats. A few had survived and spread to the outer colonies, but they were too few in number to pose a major threat. The infected Federation guard however was able to infiltrate the Federation high command and very soon Vampires would spread across the Federation, taking over entire colonies. Servalan would be quickly deposed a second time after she was discovered to be a Vampire, but she would soon try and unite the Vampires together as an army against the Federation. The new President after Servalan, a bland, boring, unremarkable man named John Ferguson was unable to muster enough support among the Federation troops and the Vampires would later capture him, where they would not only torture him to death, but broadcast his torture across thousands of worlds. Following John Ferguson’s horrific death in 2420 the Federation finally collapsed. Throughout the rest of the 25th century the entire galaxy fell into chaos. Whole planets were destroyed, others fell into a dark age, whilst others including the earth quarantined themselves from any other world to prevent Vampires from making their way to their planet. Contact between earth and outer colonies would still happen however. Ships would still try and deliver food and supplies to the outer colonies that needed them. Simply travelling from world to world was dangerous. Vampires, criminals, and other races and organisations who tried to assume power in the Federation’s absence all fought with one another constantly and attacked any passing ships that came by. Towards the end of the 25th Century Servalan would manage to unite the various Vampire factions together as her army, but she would be opposed by the Doctor, Avon and Rimmer. Servalan was horrified and shocked to see her sworn enemy Avon had somehow survived for over 100 years and when she found out that it was because he was a time traveller, she focused all of her efforts on trying to turn the Doctor into order to learn the secrets of time travel and become invincible. The Doctor, Avon and Rimmer however would ultimately managed to overthrow Servalan and force her to flee the Galaxy. Servalan would flee to an outer Galaxy that she would, over the course of several hundred years slowly take over. That empire would eventually crumble too, but Servalan would go on to build many thousands of more empires all of which would fall too. She spread the curse of Vampirism like never before, being the longest lived Vampire in all of N-Space. Servalan would be responsible for the destruction of billions of worlds over the course of millions of years. She also at one point visited E-Space where she had a feud with Romana as well. Regardless of how many of her empires fell, Servalan would always escape justice. She is believed to have lived for 100s of millions of years. Her date of death is not known, nor indeed are the circumstances of her death either, but Servalan would go on to become one of the most hated figures in all of N-Space. Servalan was already a twisted, mass murdering, perverted, ruthless monster before she became a Vampire, but after being turned Servalan would go on to become one of the single most evil and destructive beings in the entire history of N-Space along with the Master. In addition to this Servalan’s human descendants would continue to have an impact on human society for many centuries to come. Servalan had one daughter in the year 2400. Her daughter grew up to be a cruel, sadistic and selfish woman just like her mother. 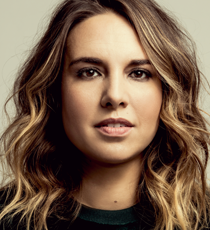 She had actually exposed her mother as a Vampire to the wider Federation and inherited her wealth which she was able to use to attain a good position on earth for her and her family. Servalan’s descendants would continue to be involved in the shadier dealings of the earth empire and the Democratic Order of Planets. The 100 year long Vampire wars would come to an end at the start of the 26th century in the year 2525 when earth would develop a new weapon capable of unravelling the Vampires DNA which they were able to use to virtually wipe them out across the entire galaxy. Over the course of the next few decades the earth would attempt to establish a new central power in the galaxy to unite the warring planets. By the 2570s earth had managed to unite several of the planets in the galaxy under the banner of the earth empire. This “empire” was not malevolent however like the Federation. In fact it sought to protect the planets under its jurisdiction. Alien worlds in the earth empire would receive aid from the earth (that had come out the best from the Vampire wars as it was the only planet that had never been invaded by the Vampires at any point.) Earth would help cure famines and diseases on various planets, and help their people rebuild their worlds. Earth would also pay out reparations to various planets that had suffered under the Federation too. These worlds would also still govern their own laws, with earth never being allowed to interfere again. However all of these planets armies would still be forced to help humanity if it ever became involved in a war, regardless of who was the aggressor, whilst humanity was under no obligation to help these worlds if it didn’t want to. Many worlds agreed to this condition simply because they had no choice. In the year 2588 an earth expedition would be sent to Telos to uncover the secret history of the Cybermen. The expedition however was founded by a secret terrorist organisation known as the brotherhood of logicians who wanted to reconquer the former Federation’s territory. The Brotherhood funded what was for all intents and purposes an archeological expedition so that they could revive the Cybermen and use them as their servants to help reconquer humanity. Two members of the brotherhood would join the expedition as double agents to free the Cybermen from their tombs when the time was right. The Second Doctor and his companions, Jamie and Victoria would arrive on Telos at the same time as the expedition. The Doctor suspected that Cleeg, one of the brotherhood had an ulterior motive, but sadly the Time Lord’s curiosity got the better of him, and he left it too late to stop Cleeg, who revived the Cybermen for the first time in 5 centuries. The Cybermen are awoken for the first time in 500 years. The Cybermen quickly turned on Cleeg and the explorers. Recognising their old enemy the Doctor, the Cybermen wished to turn them all into a new race of Cybermen and partially converted a member of the crew Toberman. The earth empire would continue to expand throughout the galaxy for the remainder of the 26th century, but in the late 2590s it would come into conflict with another vast interstellar empire, the Draconian empire. At the start of the 27th century humanity and the Draconians would establish a frontier in space to avoid any future skirmishes. Neither the Draconians or humanity really wanted to go to war with one another. The Draconians were not an evil race of conquerors like the Treens or Daleks. Sadly however both races were instinctively distrustful of one another and had many close calls, with their worst being in 2605 when General Williams fired on a Draconian vessel that was travelling to the earth to negotiate, and contained a nobleman from Draconia. The ship was a war cruiser as that was deemed the only way the noble man could travel, but its guns were empty. Still Williams felt the cruiser was an act of aggression and destroyed it. Years later he would discover that it was unarmed and would try and make amends for his sins. In 2610 the tensions between Draconia and Earth would reach their peak when a third party, the Master would attempt to manipulate the two races into a full scale conflict with one another. The Master, then in his first incarnation would send Ogrons to attack both earth and Draconian ships, often killing most of the crew. The Master would use a hypnotic device that would cause the Draconians to see the Ogrons as humans, and the humans to see the Ogrons as Draconians. Fortunately before a war broke out the Third Doctor and Jo Grant would arrive in the middle of one of the Masters Ogron raids. The Doctor was not affected by the Masters device and saw the Ogrons for what they really were. The Doctor had a hard time trying to warn humanity about the third party provoking both sides for its own benefit. The Master using a forged alias was the chief of police in the earth solar system framed the Doctor and Jo as criminals. Eventually however the Doctor was able to knock out one of the Ogrons that had attempted to assassinate the Draconian emperor, and after the Master was forced to flee, the effects of his hypnotic device wore off, allowing the Draconians to see the Ogron for what it really was. When they arrived on Draconia however, the Master was already waiting for them and he had summoned his allies, the Daleks! The Doctors two greatest enemies meet. The Daleks since fleeing our galaxy in the 24th century had settled far beyond even the andromeda galaxy. They had since discovered the secret of time travel to the point where they were able to create a machine that could travel anywhere in time and space which they had earlier used to chase the First Doctor through various locations in an attempt to exterminate him. The new Dalek race had suffered a set back in their early time travel experiments however when the Second Doctor spread the human factor throughout their race, which gave many Daleks human emotions such as compassion and remorse. A civil war broke out on Skaro between the humanized and regular Daleks which very nearly wiped out their entire race. Ultimately the regular Daleks won out, but still a few of the humanized Daleks would escape to the furthest region of the galaxy. 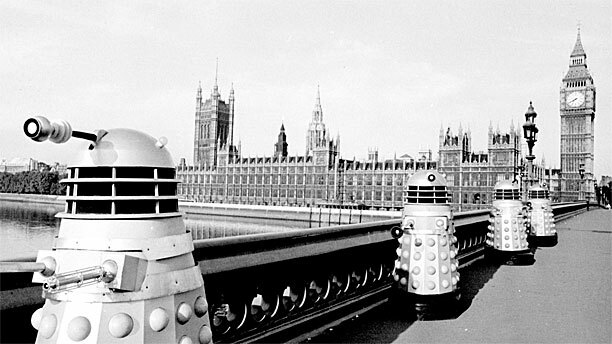 These Daleks would eventually develop their own society and religion which persisted at least until the 31st century. They referred to themselves as Deacons to distinguish themselves from the Daleks. 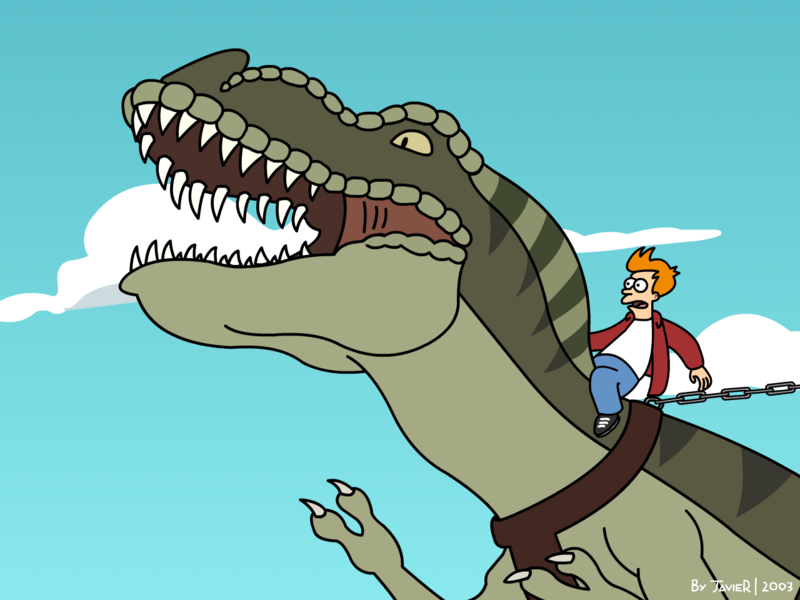 The Planet Express Crew encounter the Deacons in the 31st century. Back on Skaro the Daleks would recover from the civil war and go on to build a massive empire that dwarfed the previous one belonging to the Zolfian and Yarvelling Daleks. After their invasion was foiled the Daleks would attempt to abduct the Doctors TARDIS from the time vortex itself. Instead however they abducted the TARDIS of the Doctors archenemy, the Master. The Daleks initially believed that the Doctor had just changed his face again and prepared to kill him, but the Master was able to talk his way out of it. He convinced the Daleks that he could be of help to them in destroying the earth and Draconian empires. The Daleks were preparing to launch a full scale invasion of our galaxy. They were more advanced than humanity, and their empire was several times larger than earth’s and Draconia’s. However the Daleks knew that if they were to attack the earth empire, then all of the neighbouring great powers of our galaxy and its neighbouring galaxies would unite against them. The Daleks reputation was still worse than humanities even after all this time. The Daleks wouldn’t just have to fight the earth, but several entire galaxies. Though they were more than willing to fight all of the great powers, the Master promised the Daleks that he could make their conquest easier by provoking a war between earth and Draconia. The Master believed that a war between earth and Draconia could potentially escalate to include the other great powers, as many of them still had interests in the earth and Draconian empires. Once the war had destroyed most of the great powers the Daleks could easily move in and conquer the survivors. The Daleks agreed to let the Master live for now whilst he put his plan into action. The Master meanwhile whilst provoking a war between earth and Draconia, tried to find a way to make his hypnotic device work on the Daleks in the hopes of provoking a civil war among their race that would wipe them out. The Master would also prolong his life by giving the Daleks information on the Time Lords and their history which had eluded them until now. The Masters actions would ultimately be what helped to elevate the Daleks to a level where they could threaten the Time Lords. General Williams entire team were slaughtered by the Daleks and Williams, the Doctor and the Prince of Draconia were taken before the Gold Dalek who wished to exterminate all 3 of them. The Master however wanted to prolong the Doctors torture by making him see the earth and the galaxy he loves so much in ruins, and so he convinced the Gold Dalek to keep him alive until the war was over. The Doctor, Williams and the Prince would escape however, with the latter two fleeing back to earth and Draconia to warn their people of the Daleks intentions. The Doctor meanwhile would be wounded by the Master in a final shoot out before making his way back to the TARDIS. There the Doctor would send a telepathic message to the Time Lords, telling them that he needed to find the Daleks base. Even with the Masters plan foiled, the Daleks would still be more than powerful enough destroy the earth and Draconian empires. The Time Lords directed the Doctors TARDIS to Spirodon. Here the Daleks were working to create a virus that would allow them to wipe out most life in our galaxy. They were also through experiments on the native life forms who they had conquered, the Spirodons, attempting to master the secret of invisibility. Finally the Daleks were also preparing a massive army on the planet Spirodon too, who were kept in stasis until the time was right. The Doctor was able to position one of the Thals bombs by an ice volcano near the Daleks base which caused an eruption, burying the Daleks base, their army, all samples of their plague, and all of their research on invisibility under thousands of tons of molten ice. The Thals would then escape by stealing the Dalek supreme’s vessel leaving him trapped on Spirodon, whilst the Doctor and Jo escaped in the TARDIS. The Doctor had set back the Daleks greatly. Not only had they lost their two key weapons, the secret of invisibility and their plague, but earth, Draconia and various other great powers were now united against them. Still the Daleks still felt confident that they could destroy the great powers. The plague, the Masters plan to create a war were only to make the Daleks invasion easier. From the year 2610 to 2690 earth, Draconia and various other great powers across the Galaxy would unite to fight the Second Dalek empire. The war was the bloodiest in our galaxies history. Humanity did not suffer as many casualties as they did during the Dalek war, but that was only because so many races were involved. Still humanity did endure incredible losses. The greatest since the Dalek invasion. Over 30 billion people were killed in the second great Dalek war. From all the great powers combined, over a 100 billion people would be killed in the conflict against the Daleks. The Daleks would eventually be beaten back in the 2690s however, having lost billions of soldiers of their own during the war. Their final strike took place on the planet Calesk, on the very outskirts of the galaxy. Here the Daleks attempted to create a weapon that could rip a hole in the fabric of the universe. The Daleks hoped to use it to create worm holes in any part of the universe that could destroy their enemies fleets. Little did the Daleks know however their weapon was so unstable that it would actually shatter the barriers between N-Space and every other universe causing them to all bleed into one another, leading to the destruction of all universes as all anti matter realities would bleed into their counterparts. The Daleks experiments already created several rips between realities, which caused the USS Enterprise from D-Space to fall into N-Space. The USS Enterprise was the flagship of the Federation from D-Space, a benevolent organisation that united several planets together. This was the original Enterprise, piloted by Captain James T Kirk. The Enterprise arrived in Calesk’s solar system where it was almost destroyed by the Daleks. Fortunately however the Third Doctor arrived on the Enterprise in time and would help the crew escape the Daleks. Though the Enterprise suffered many casualties (more on this mission than any other in fact.) With their help, the Doctor was able to destroy the Daleks weapon and their base. With Calesk gone, the Daleks last chance of victory was lost and the monsters were forced to retreat back to their empire, whilst the Enterprise returned to D-Space before the tears in reality healed. Whilst the Daleks were beaten back, they still held on to their empire. None of the great powers including the earth had the willpower to wage another war against the Daleks again in order to rescue the planets under their rule and so a truce was called for now. Over the course of the next 40 years however the Daleks would still launch many attacks on the earth and various other powers across the galaxy. These incidents never led to another full scale war, but they still saw a heavy loss of life. One of the most notable incidents however came in the year 2702 when a space plague began to sweep through the galaxy killing millions of people on colonies around the galaxy. The only known cure for the plague was parrinium a substance that was most common on the planet of Exillion. Unfortunately however any ship that went to Exillion never returned as the city would drain any vessel that landed of all its power. Still with no other choices the Earth empire would dispatch a ship to Exillion to mine for parrinium. At the same time however the Daleks would dispatch a vessel to the planet. The Daleks hoped to mine the parrinium themselves and then destroy the surface of Exillion to prevent humanity from obtaining any more supplies. The Daleks would then use their supply to hold the earth to ransom and effectively make them surrender. Both ships however were affected by the power drain from the city. The Daleks weaponry would also be rendered completely useless by the power drain as well, forcing them into a temporary alliance with the human party, and the Third Doctor who had also landed on Exillion with his companion Sarah Jane. The Daleks lied to the Doctor and the humans that they were suffering from the same plague too, though the Doctor naturally had his doubts. The Doctor, the Daleks and the humans would struggle to survive together at first against the hostile Exxilons who attempted to sacrifice the Doctor and Sarah to the City that they worshipped as a god. The Daleks however were able to overcome the power drain by replacing their dead ray guns with machine guns that allowed them to slaughter the Exxilons on mass and conquer their planet. The Daleks would then force the Exxilons and the humans to mine the parranium for them. The Doctor meanwhile would work with a rogue Exxilon named Bellal to infiltrate the Exxilon’s city where he would scramble its brain eventually causing the City to die. At the same time the Daleks also destroyed the beacon of the city, restoring power. Now at full strength the Daleks revealed their true plans to the humans and the Doctor and that they intended to launch a plague missile onto Exillon once they were in space, rendering further landings impossible on the surface of the planet. The parrinium would be shipped back to the earth colonies, curing the plague. Whilst the Daleks would send their agents to infiltrate and attack various human colonies and bases, earth and various other powers would send their agents to fight the Daleks too. Almost all of the agents sent to fight the Daleks however never returned. 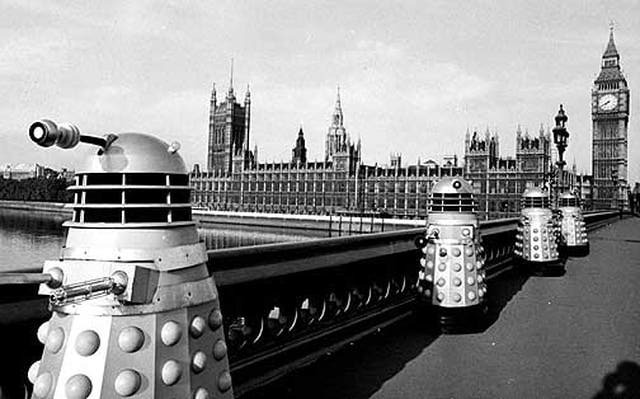 Eventually the earth government would send criminals in against the Daleks, as they couldn’t find any volunteers. One of these criminals Abslom Daak would go on to become one of the most notorious enemies of the Daleks. Originally Daak just joined the war against the monsters to escape the death penalty but it later became more personal for him when the woman he loved was killed by the Daleks. Daak would work with the Doctor on many occasions. Though the two had very different methods, they nevertheless would make an effective team against the Daleks. Abslom Daak uses his trademark weapon, a laser chainsaw on the Daleks. Daak would later go on to travel with the Twelfth incarnation of Romana in E-Space for many years who he developed feelings for. Daak would spend much of his life travelling with Romana 12 who he fell in love with. She never returned his feelings however, but the two still had a very close friendship. These skirmishes would continue for the first few decades of the 28th century until the Daleks would be caught in a war with another, equally vicious race of machine creatures known as the Movellans. The Dalek and Movellan war would last for a further almost 2 centuries, during which time all of the Daleks hostilities with the earth ceased as the monsters pulled all of their efforts into fighting their new enemy. The rest of the 28th century would be a more peaceful time for mankind as it spread further out into the galaxy and made new advancements in technology. There would be great advancements in robotics during this time, with many robots developing full sentience for the first time. Another major advancement during the 28th century included limited time travel technology which was able to pull people from just before their moment of death. The technology to develop this had first been mapped out by Ron Popeil in the 21st century when he discovered a crystalline surface. He wasn’t able to harness its true potential however, and though there would be some study in the Crystalline’s in the 23 century, it wasn’t until the 28th century that they would be harnessed to their full potential. Even then however this time travel technology was extremely limited. It could not pull a person’s full body into the present. Only their heads would be brought through time. These time displaced heads were kept in jars surrounded by the crystalline substance to keep them in the present. This crystalline substance could also de age them to their prime too, and effectively allow them to live forever. When this technology was first unveiled many hailed it as the greatest invention in the history of mankind, but others viewed it as inhuman to keep people locked in a state between life and death. Attempts were made to harness the crystalline substance in such a way that the full bodies could be brought into the present, but sadly this was never achieved as the Crystalline substance was too limited. The heads would be able to overcome this by having robot bodies and even clone bodies attached. 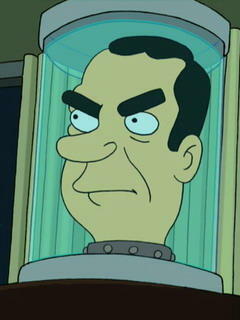 Many of the heads would on to live very productive lives, with Nixon even becoming President again in the 31st century. The biggest controversy involving the heads would happen at the end of the 28th century when Jesus was brought back through the crystalline’s. Jesus’ head would disavow the religions that worshipped him and tried to tell humanity the truth about God. Unfortunately however this led to mass riots in the streets and many denouncing Jesus (and by extension the rest of the heads) as fakes. In order to save their business the head museum would send Jesus backwards in time. Several advancements in cloning and genetics would be made throughout the 28th century too which would result in humans becoming a lot more durable than ever before and life expectancy increasing until the late hundred and 50s. The Furons would also recover in the 28th century. Ironically they would be aided by humanity. The human race felt a certain kinship with the Furons, due to the fact that all humans contained some Furon DNA, and Crypto had still saved mankind from various threats. They would offer the Furons asylum from their enemies in the Earth empire, as long as they would aid humanity in any future wars. The Furons happily agreed and ironically thanks to humanity they would slowly begin to rebuild over the next few hundred years. Unlike the other races in the earth empire the Furons were able to convince humanity to make concessions to them. Human criminals would be shipped off to the Furons to allow Orthopox to carry on his experiments. At the start of the 29th century mankind would be called into yet another intergalactic war with their old enemies the Cybermen. These Cybermen were the survivors from Planet 14. After their failed attempt to conquer Kaldor city these Cybermen had since built up a massive invasion force and were able to convert entire worlds into members of their own kind. The Cybermen would have the upper hand against humanity in the war, but the human race and their allies would be assisted by the Vogans. The Vogans originated from a planet made of gold, the one metal which was fatal to the Cybermen and they supplied vast amounts of gold to the Cybermen’s enemies allowing them to destroy the Cyber fleet. Just before they retreated however the Cybermen would fire a Cyber missile at Vogan which devastated the surface of the planet. Furthermore as many other planets had been made aware of the planet of gold then there would be more invasions of the planet from other races. Eventually humanity would place a quarrantine around Vogan ten years after the Cyber wars in the year 2840. However even with the quarrantine, the Vogans would still retreat underground for the next 60 years . On earth meanwhile a group of Silurians would be revived in the year 2850. Things would be peaceful between the Silurians and humanity at first, but sadly it didn’t take long for things to escalate between them yet again. Part of the reason for the conflict was because these Silurians wanted to revive the other members of their kind, but the earth government refused for now, believing that it would create more problems on the already overpopulated earth. Both the humans and the Silurians made attempts to destroy the other which ended in the deaths of the Silurian group. Nevertheless as the reptiles had been brought to the public’s attention, the government would search for other Silurian hibernation chambers around the world. Terrified of what would happen if the Silurians awoke, but not wanting to destroy the Silurians, the government would have the Silurians shipped out to an uninhabited planet that had been terrorformed to resemble earth 65 million years ago. Several of the Dinosaurs kept in suspended animation however would be kept on earth in Zoos. Dinosaurs buried under the earth in the Silurians preservation chambers are revived for the first time in 65 million years. There were widespread complaints and protests held on earth from the population, with people arguing that the Silurians had just as much right to live on earth as humanity. There would also be Silurian groups who would launch attacks on the earth to try and reclaim it. 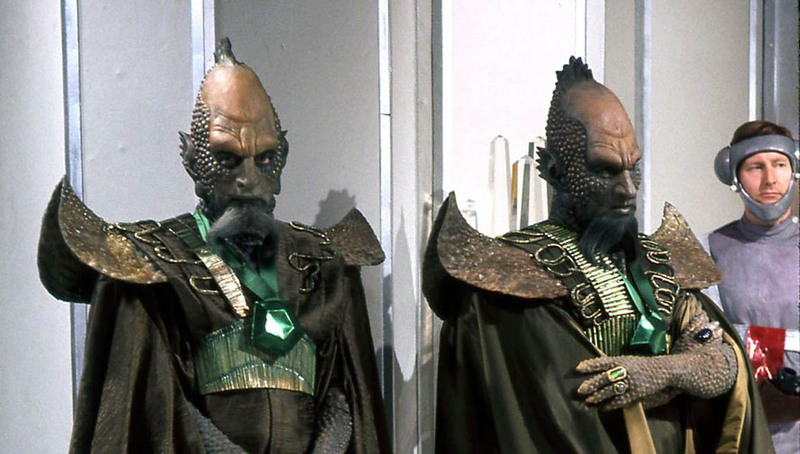 The Silurians adapted to life on their new planet and would by the end of the 29th century establish more peaceful relations with humanity and both races would even share technology with one another. Still relations were never completely easy between humanity and the Silurians. Things would only get worse in the 29th century when several aliens would come to settle on earth and be granted full citizenship. Many Silurians would launch terror attacks on the earth decrying both humans and the aliens who had settled there such as the Decapod’s phoney earthlings. By the end of the 29th century the Daleks and the Movellans had become locked in a logical empase. Neither could fire a shot without the other’s battle computer finding a way to block it. The Daleks would seek out their own creator Davros in an attempt to try and break the stalemate. The Daleks had by this stage abandoned Skaro. Having plundered it of what little resources it had left, the Daleks were now scattered across hundreds and thousands of worlds. In the year 2887 a small group of Daleks, along with several slaves would land on Skaro and dig through the ruins of the old Kaled bunker to find their creator Davros. The Emperor of the Daleks was aware that Davros had not died when they shot him centuries ago. He had found the notes about his life support machine and worked out that he had simply been placed into a state of suspended animation. The Emperor had kept this knowledge secret however in case the Daleks ever needed their creator again one day. Unfortunately however for the Daleks, both the Movellans and the Fourth Doctor along with his companion, the Second Romana would land on Skaro just as they had almost finished digging through the ruins of the bunker. The Doctor would be able to make his way to the ruins of the bunker where Davros had simply been left for thousands of years before the Daleks. Davros had been placed in a state of suspended animation by his life support machine, whilst it slowly regenerated his organs. The entire process had taken over 1000 years, but Davros was now ready to live again. The Doctor did his best to try and get the revived Davros away from the Daleks, but the monsters in retaliation started to exterminate their slaves until the Doctor was forced to release Davros back to them. The Doctor however was able to negotiate with the Daleks to release their prisoners which they regrettably did. The Doctor soon discovered the truth about the Movellans, that they were not only no better than the Daleks but that they wanted to destroy Skaro to prevent the Daleks from breaking the stalemate. The Doctor however was able to lead the freed Dalek slaves to overpower and destroy the Movellans. Though highly advanced, the Movellans could be easily overpowered physically as simply pulling their power pack free would be enough to deactivate them. Davros meanwhile grew paranoid about the Movellan spacecraft and sent all but one of the Dalek squad to it, strapped with explosives to the craft to destroy it. The Doctor however managed to make his way to Davros and destroyed the Dalek that was guarding Davros before forcing him to detonate the bombs early, destroying the Daleks before they reached the Movellan ship. The escaped human slaves would escape Skaro in the Movellans ship taking Davros with them as prisoner. The Daleks were too preoccupied to rescue Davros and he would be taken back to Earth where he was tried for his crimes against the rest of the universe. Davros was found guilty and placed in suspended animation where would remain for close to a century. In the year 2897 a small group of Planet 14 Cybermen would attempt to destroy Voga before beginning their second campaign against the Earth Empire. The Cybermen attempted to send three captured humans, strapped with three Cyber bombs to the centre of the planet which would rip the planet to pieces. The Doctor however would foil the monsters plans and destroy the Cyber ship. The unified Cyber race would prove to be more powerful than any before and it would expand throughout the 30th century, building up a massive empire. The earth empire meanwhile would fall throughout the 30th century. Many of the worlds that had previously been dependent on earth had become advanced enough to survive on their own. More importantly the human race found that it simply didn’t have the resources to waste on other planets anymore. In the 2960s, the earth empire finally collapsed and by the end of the decade, earth would help form the Democratic Order of Planets along with various other races who would all be treated as equals. In the year 2977 the Dalek and Movellan war would finally come to an end when the Movellans created a virus capable of attacking the Dalek mutants. The plague spread throughout their entire empire and very nearly destroyed their race. The Movellans in turn would be destroyed when various allied powers attacked them. The allied powers had been waiting for the right moment to strike. They had considered attacking the Daleks and the Movellans when they were both distracted fighting one another, but there was concern that the Movellans and the Daleks may unite against the allied powers. Instead they decided to wait until one had destroyed the other and then strike at the winner whilst they were weakened. The Movellans worn down by centuries of fighting the Daleks were quickly overrun and destroyed. The last surviving Daleks would be forced to flee from the allied powers and the earth empire to try and survive. They would perfect android duplicate technology which would allow them to infiltrate various planets across the galaxy and for a while remain hidden. In the year 2980 the Daleks would rescue Davros from the prison ship, but their creator soon turned on them. Davros knew that the Daleks had no real loyalty to him and would discard their creator once he had served them. Davros wished to create a new race of Daleks and after poisoning several of the Daleks that had saved him with samples of the Movellan virus, managed to escape to Necros. During this same year a group of Daleks would infiltrate the earth with the aid of their android duplicates. These Daleks would attempt to destroy the planet by using the mutants in the sewers. The descendants of their original creations, the mutants had since built a thriving society in the sewers. The Daleks however having found that their DNA had mutated to unprecedented levels wanted to study them and create a new race of mutants to serve them. The Daleks would easily enslave the mutants and perform absolutely horrific experiments on them. Thousands of mutants were killed, entire communities were wiped out by the Daleks actions. Sadly no one on the surface even knew the Daleks were underground as no one cared about the mutants. They were seen as inferior scum at best by the surface dwellers. Fortunately the Doctor and his companion Leela would help the Mutants and defeat the Daleks before they could unleash their army of new mutants on the surface. Most of the Daleks new mutants were destroyed, but a few would surface below the regular mutants “city”. One of these mutants, dubbed El Chupanibre, would terrorize the regular mutants for many decades after. Leela faces the Daleks in the sewers of New York in the 30th century. During her adventure against the Daleks, Leela saved the life of a young mutant couple Turanga Morris and Turanga Munda. At the time Munda was pregnant with their only daughter who Munda decided to name Leela after the woman who saved her and her husband’s life. Munda and Morris’ child was initially only born with one mutation, a single eye and they felt that she was too “normal” to not be allowed to live on the surface. 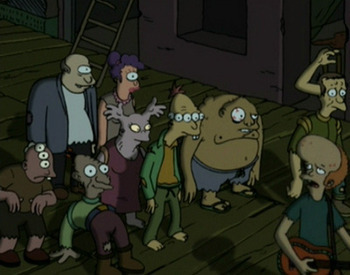 The two mutants would disguise Turanga Leela as an alien and abandoned her at an orphanage where she would be raised. Leela would believe she was an alien abandoned on earth for the first 25 years of her life. Still her parents would always watch out for her throughout her early life from the sewers and help her out from time to time. Leela would later learn that whilst her parents gave her up to ensure a better life for her, they never abandoned her. On Necros meanwhile Davros would quickly take control of its main facility, Tranquil Repose and use it to create his new army of Daleks. Tranquil Repose was a medical facility where those dying of terminal diseases were kept in suspended animation until a cure could be found for their condition. Davros would transform some of the people kept in suspended animation into his new race of Daleks, conditioned to obey only his will. He chose those he deemed to be the greatest intellects and strongest minds to be his new race of Daleks. Those he judged to be the lesser intellects meanwhile he turned into food and sold to the outer planets in order to gain money for his experiments. The Doctor is horrified to hear what Davros has done to the Tranquil Repose facility on Necros. With his new army of Daleks completed, Davros would then lure his archenemy the Doctor (then in his Sixth incarnation) to Necros as part of a trap. Davros succeeded in capturing the Doctor, but just as he was about launch his new army, his original Daleks arrived and captured him. These Daleks had been summoned by one of the staff at Tranquil Repose who had grown to despise Davros. Whilst the Daleks took Davros back to Skaro to stand trial for his crimes, they also intended to recondition his new army of Daleks to be loyal to them. Fortunately however a knight named Orcini who had been hired to kill Davros, but who still wanted an honourable kill destroyed the Dalek army with a bomb before they could be activated. The Doctor would subsequently convince the people on Necros to harness the planets on the planet to create a food source to feed the starving planets. Davros meanwhile would later escape from the Daleks. He would spend the next few years attempting to take control of the monsters only to fail each time. Davros in his new form. Davros’ Daleks on Skaro would be referred to as the Imperials, whilst the original Dalek faction would be referred to as the renegades. Both factions would over the course of the next century or so build up their own empires whilst constantly warring with one another. In the year 2985, the new Cyber empire had expanded to such an extent that the earth grew terrified and would attempt to mount an alliance between various other races even beyond the Democratic Order of Planets against the Cybermen. The Cybermen however would attempt to stop the conference from going ahead by planting a Cyber bomb on the earth which would have been capable of destroying the entire planet. The Fifth Doctor and his companions however would successfully deactivate the bomb, but the Cyber leader had a back up plan. He would crash a gigantic ship into the earth filled with Cyber bombs which would render planet uninhabitable. Despite his best efforts the Fifth Doctor was no match for the Cybermen who were able to steer the ship towards earth. Unfortunately for the Cybermen however their own technology inadvertently sent the space ship back 65 million years where it was the cause of the final extinction of the Dinosaurs. The Cybermen however still achieved a small victory over the Doctor as they forced his companion, Adric to remain behind on the ship as it crashed. Adric’s death would continue to haunt the Doctor for centuries to come. The alliance of planets would wage war on the Cyber empire which would last from 2985 until the year 2997. The alliance of planets was the largest humanity had ever assembled and ultimately even the Cybermen couldn’t withstand it and they were eventually beaten back to Telos. One group of Cybermen did manage to make their way to earth during the war where they would revive several of earth’s giant monsters buried under the ground as Cybernetic monsters. Among these included several of the Gyaos and King Ghidorah. The earth would be forced to turn to giant monsters such as Godzilla and King Kong for help. All of earth’s giant monsters had continued to live on Monsterworld for the past 1000 years. Their mutated metabolism would allow them to survive for several thousand years, though by this stage baby Godzilla had fully grown meaning there were three Godzilla’s now. The Federation had attempted to weaponize Godzilla in the 24th century, but the monsters were too powerful for the Federation to capture. The monsters had played a brief role in helping to fight back the Daleks during the second great Dalek war. The Democratic Order of Planets would still nevertheless be able to bring Godzilla, King Kong, Jiras, and Anguirus back to earth with the help of the 12th Doctor. Back on their home planet for the first time in close to 1000 years, the monsters would battle the Cyberized versions of their old enemies such as Ghidorah and Gyaos. Godzilla and his allies would destroy the Cybermen’s monsters whilst the Doctor destroyed their invasion force on earth. The monsters would then be shipped back to Monster World. In the year 2998 the Cybermen would succeed in capturing a time vessel which they attempted to use to change the history of the universe by preventing Mondas’ destruction. These plans were foiled by the Sixth Doctor, and with the last suriving Cryons help, the Sixth Doctor was also able to destroy the Cybermen’s base of operations on Telos, forcing the last of the Cybermen to retreat across the universe. By the end of the 30th century human civilisation was thriving like never before thanks to both its own technological advancements and those of the various alien species that had come to settle on the earth. However this would create a problem of people in the 30th century becoming decadent as they no longer had any responsibilities. In order to get round this the government would force people to take jobs through computer chips implanted in their minds. Those who lacked the chips were deemed outlaws. 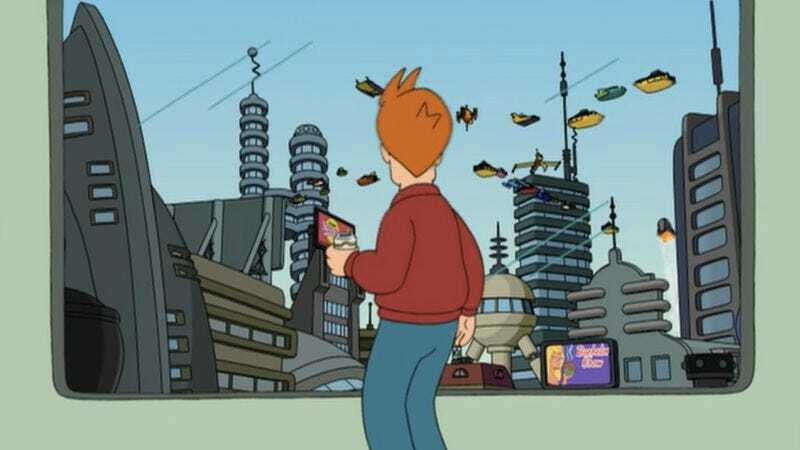 At the end of the year 2999 Philip J Fry would be awoken from his 1000 year long slumber. Having been preserved solely to battle against the Brain Spawn when they returned, Fry was not sorry to leave his life in the 20th century behind as he felt his life was going nowhere. 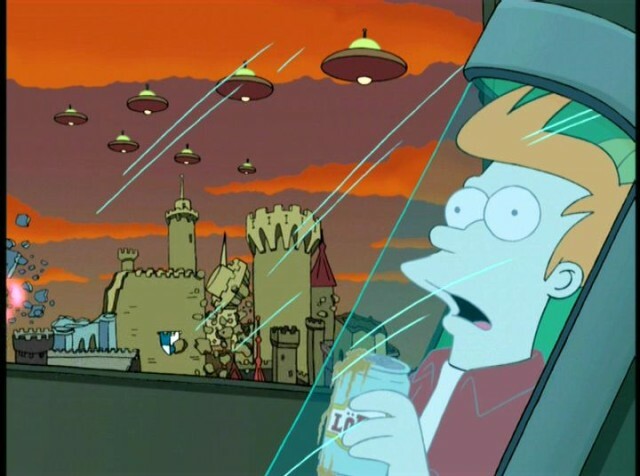 Fry awakens in a very different world to the one he left behind. Sadly however the job he was assigned by Turanga Leela at the cryogenics lab was the same as his job from the 20th century, a Delivery boy. He refused to go back to his old life and fled from Leela who tried to install his career chip. . Along the way Fry encountered a robot, Bender and the two of them would soon forge a strong, if somewhat unusual friendship. Leela would catch up to Fry in the ruins of Old New York where the two bonded over the loss of their family and not fitting in 30th century earth. 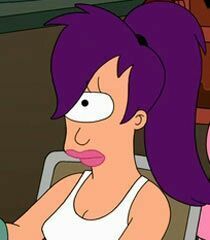 Fry inspired Leela to quit her job, and the three of them tracked down Professor Hubert Farnsworth, Fry’s great, great, great, great, great, great, great, great, great, great, great, great nephew. Farnsworth ran a delivery company called Planet Express which he used to fund his outlandish experiments. His old crew had been tragically killed on an expedition against gigantic bees and he was only too happy to hire Fry, Bender and Leela. Despite the fact that he was a Delivery boy again, Fry was happy to work for the Professor. Whilst only a delivery company, the Planet Express crew would become involved in many of the most important events in earth’s history throughout the 31st century. In the final article of the series we will take a look at the golden age of mankind in the 31st century, how the Daleks and the Cybermen would rebuild their shattered empires, the cold war between the Daleks and the Time Lords, the fall of mankind and its enslavement at the hands of the Apes, the Furon wars, the second Ice Age, and the final fate of mankind.